I had these for breakfast. 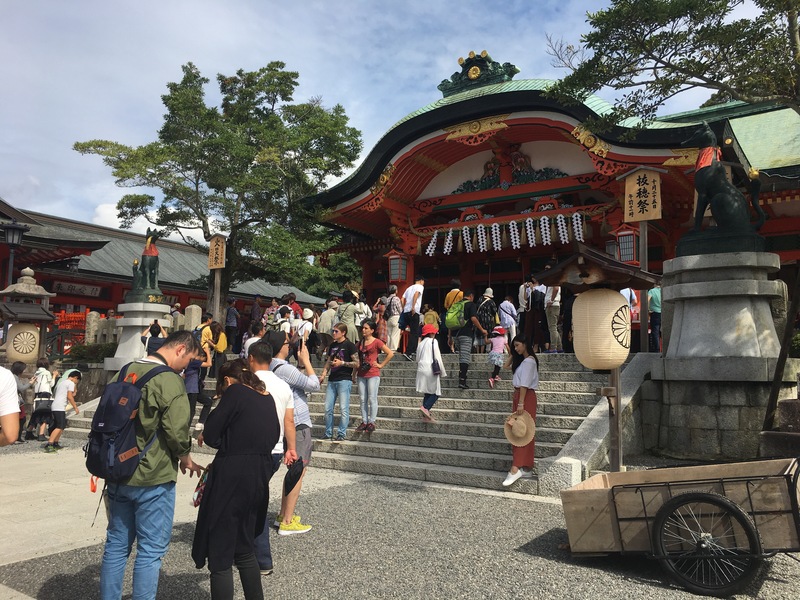 to visit Ishiyama Dera (Ishiyama Temple). 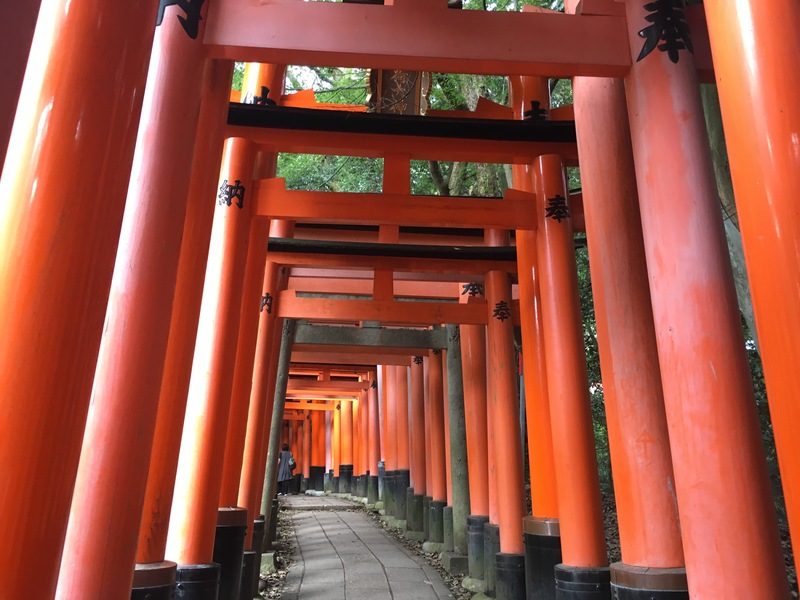 It’s guarded by Nioh (guardians). 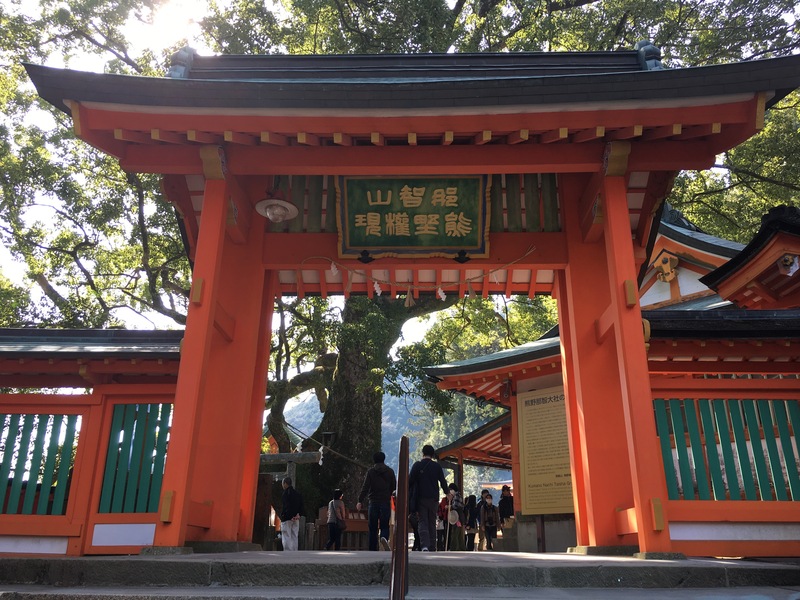 It’s Spring so Temple is so green. Walked through old aged stone for fun. 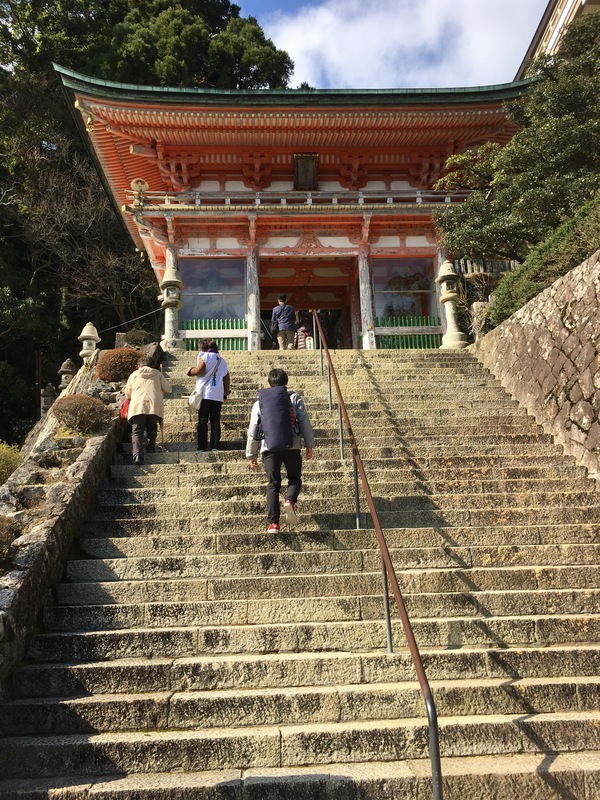 On the way to Hondo (the main temple), there are many temples to visit and pray. 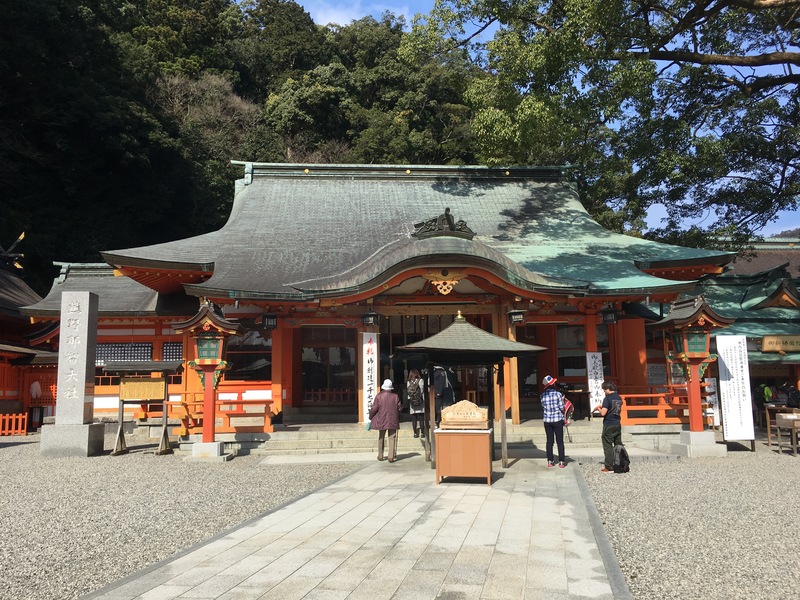 At Hondo (the Main Temple), I prayed to Nyoirin Kannon (Goddess). 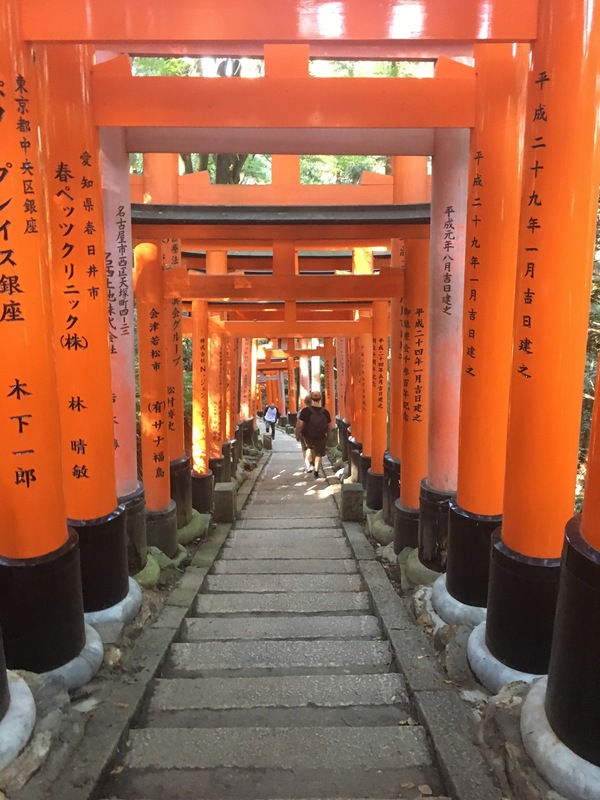 After visiting Hondo, there are still many places to visit. And the path are beautifully decorated by azalea. 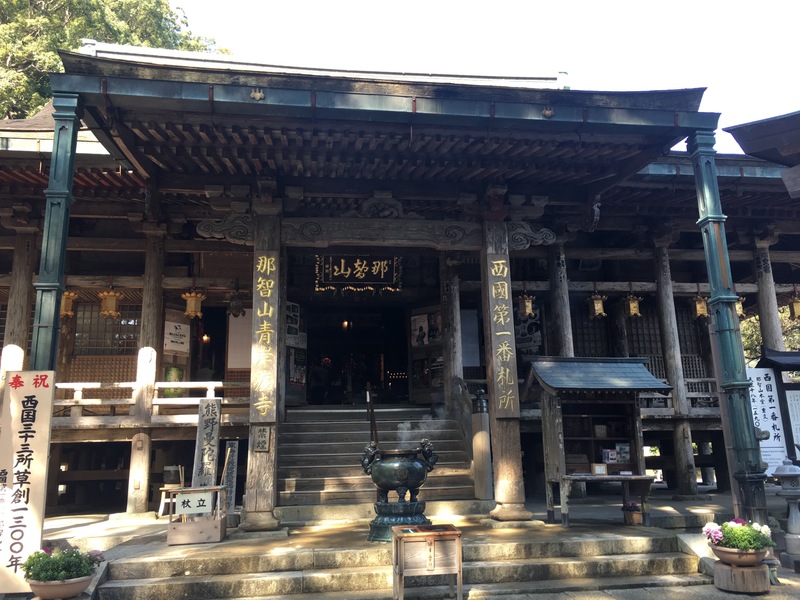 This is the map of Ishiyama Temple. 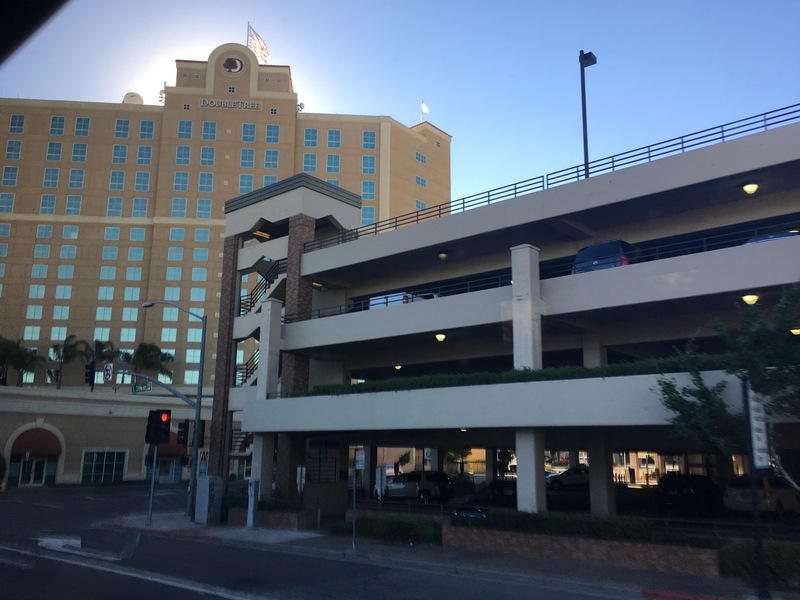 You can see that there are many places to visit in the premises. We are half way now. 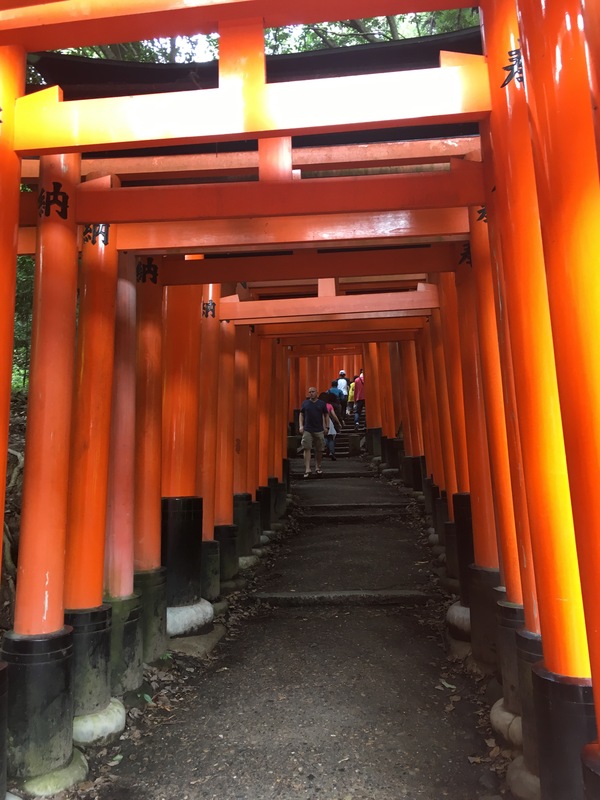 We continued walking down the path. 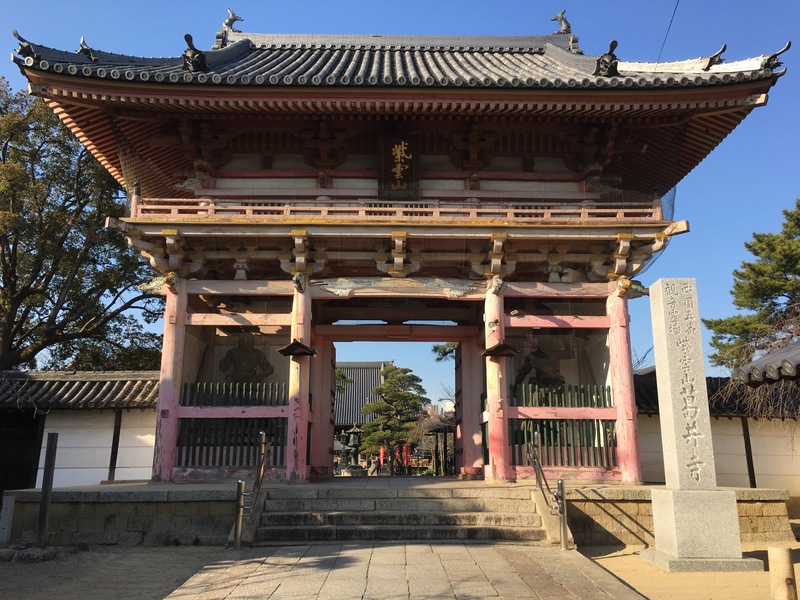 The door for this temple is opened specially from 28 April – 20 May 2018, allowing us to meet three special Buddha. We are so lucky to be here today. 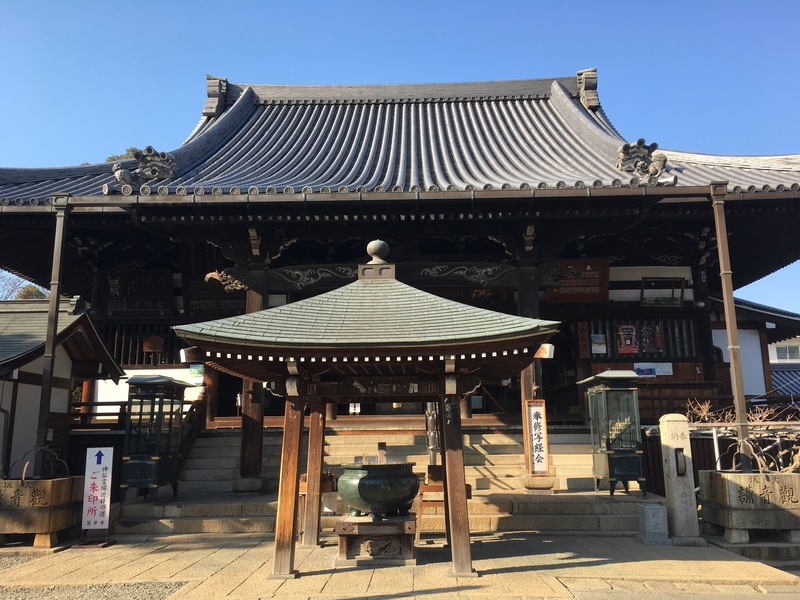 The first Japanese lady love story writer, Murasaki Shikibu used to visit this temple to get inspirations to write Genji Monogatari (Mr. Genji’s Story). 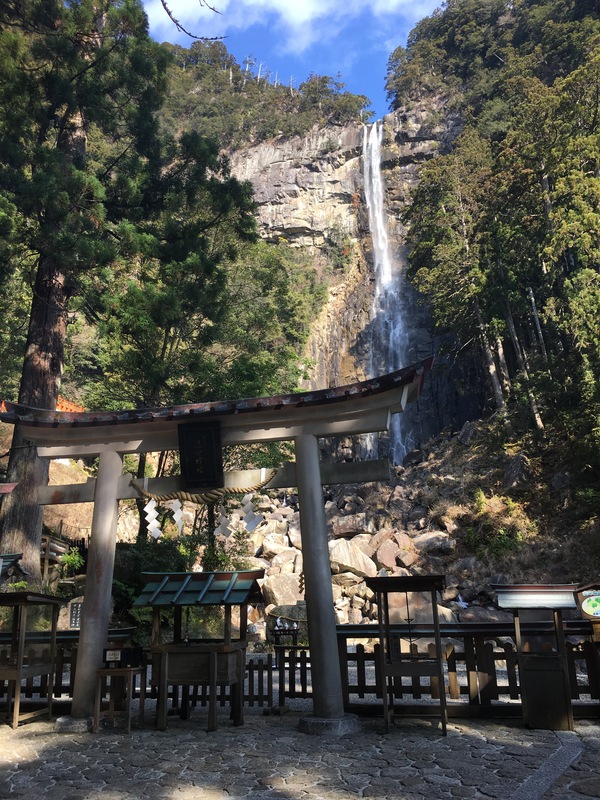 There is Kanro Daki (Kanro Fall). And nice Shobu En (iris garden). 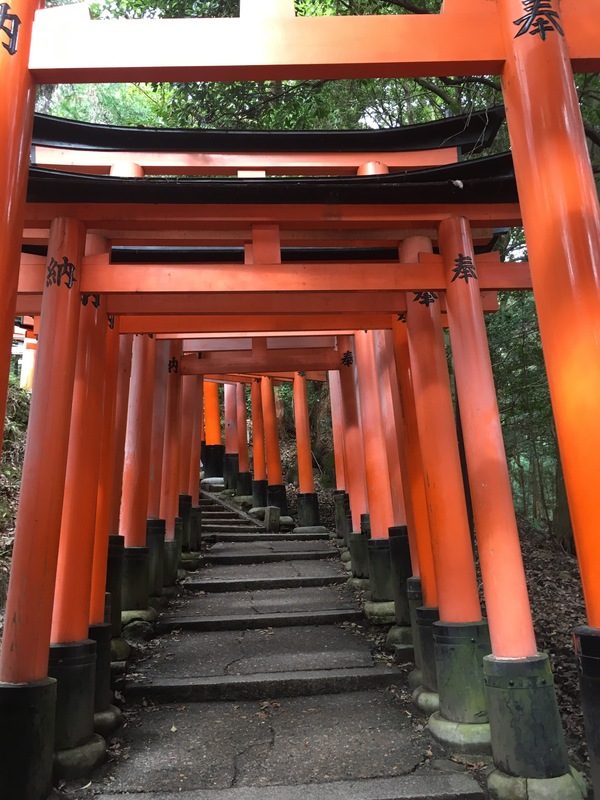 I cannot enter, but there is a path to the sacred place looking mysterious. 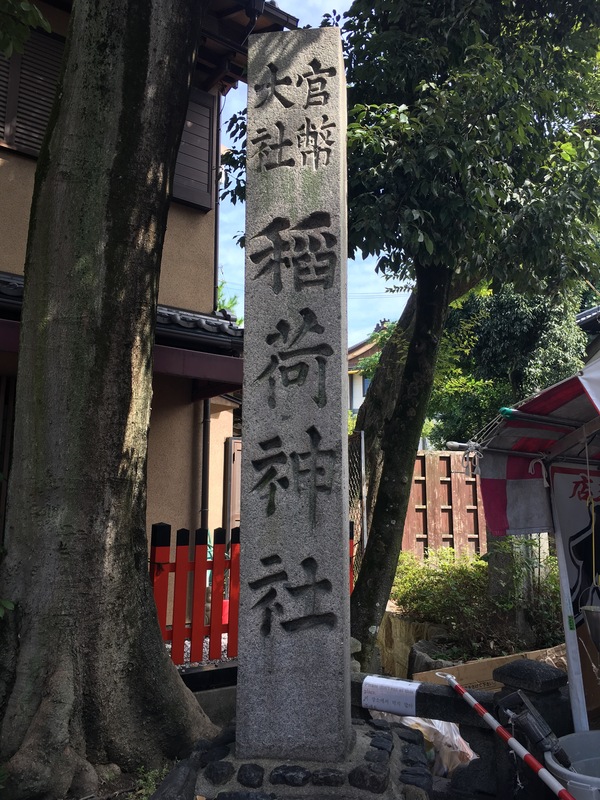 There is a holy stone. 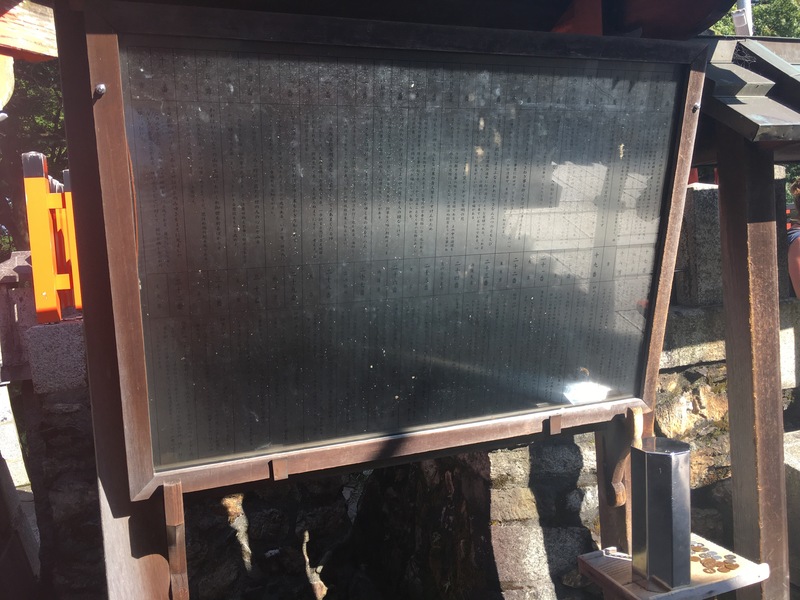 According to the signage, it says Ooyuya, meaning a big bath…? 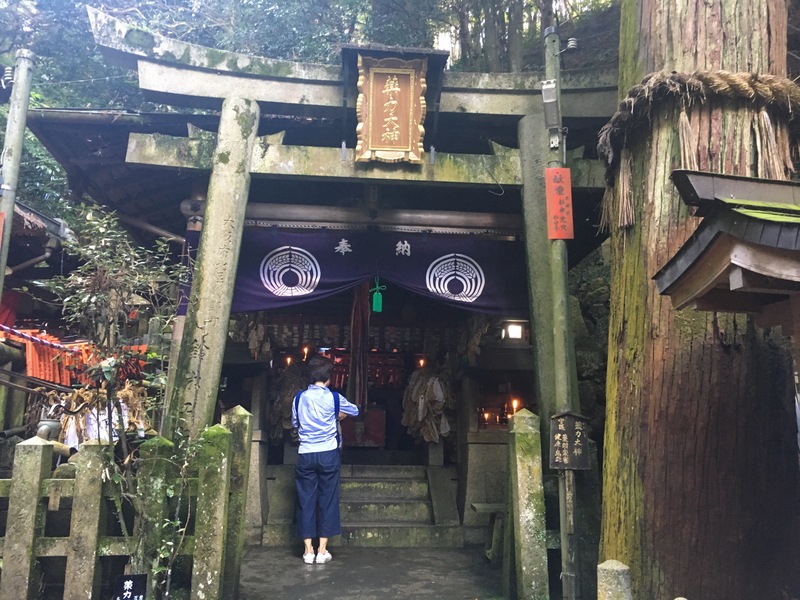 I also prayed to the very important God: Daikokuten (God of Wealth). 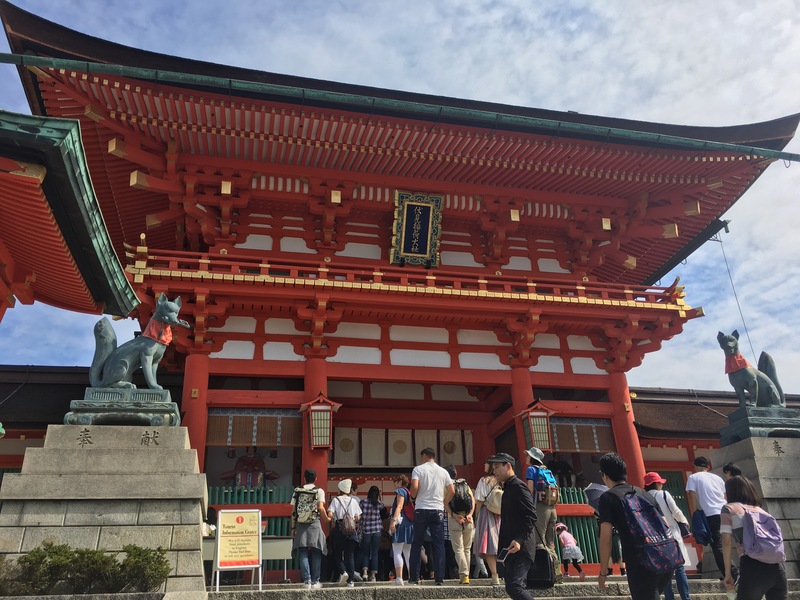 At last I prayed to Kinryu Ryuoh (Golden Dragon King) for preventing bad luck and bringing good luck. 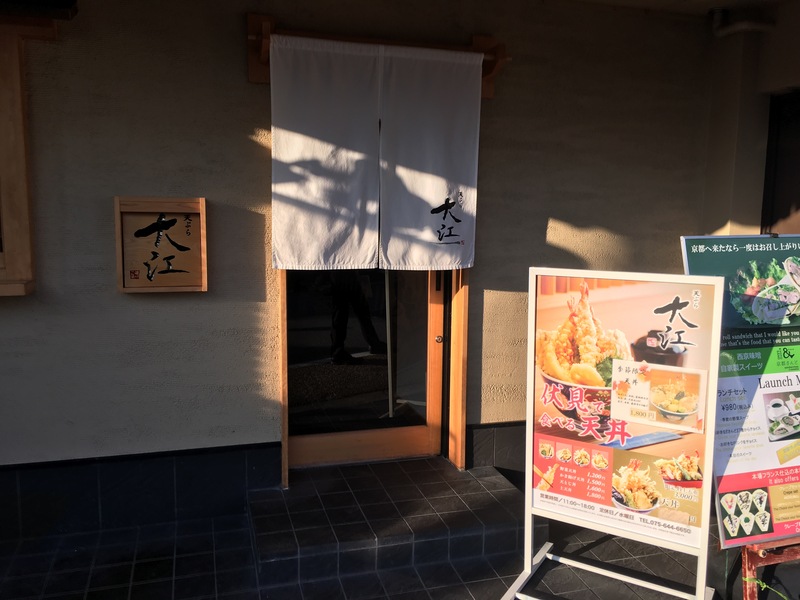 After visiting Ishiyama Temple, we took a breath at tea room, Kanou Shojuan, to enjoy Ishimochi (stone rice cakes). 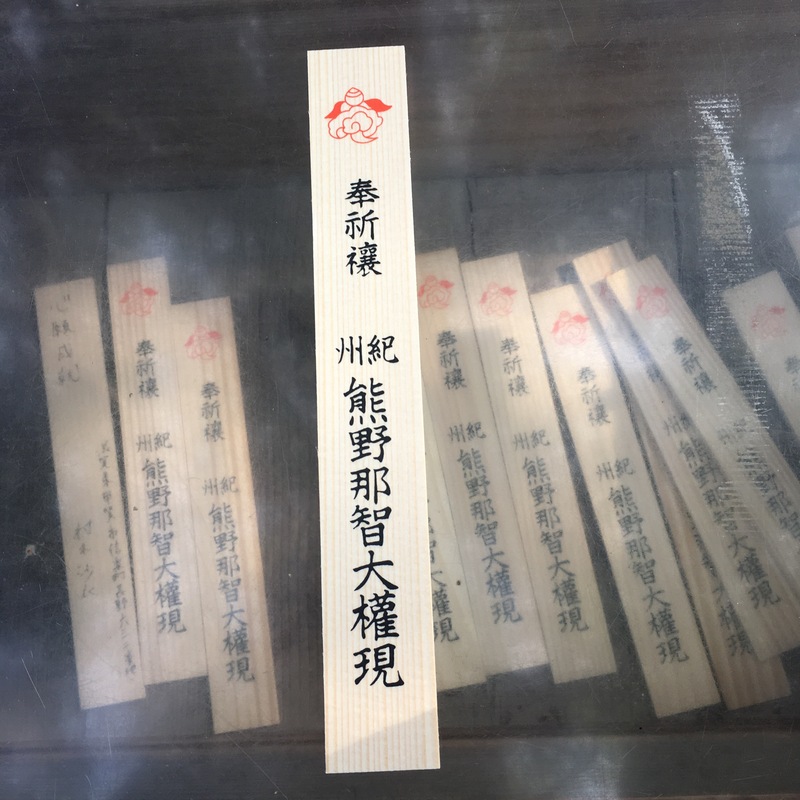 Ishimochi presents strong stone foundation of this temple, wishing for prevention of bad luck and establishment of strong tie. I had dinner appointment with my old Kyoto friend. 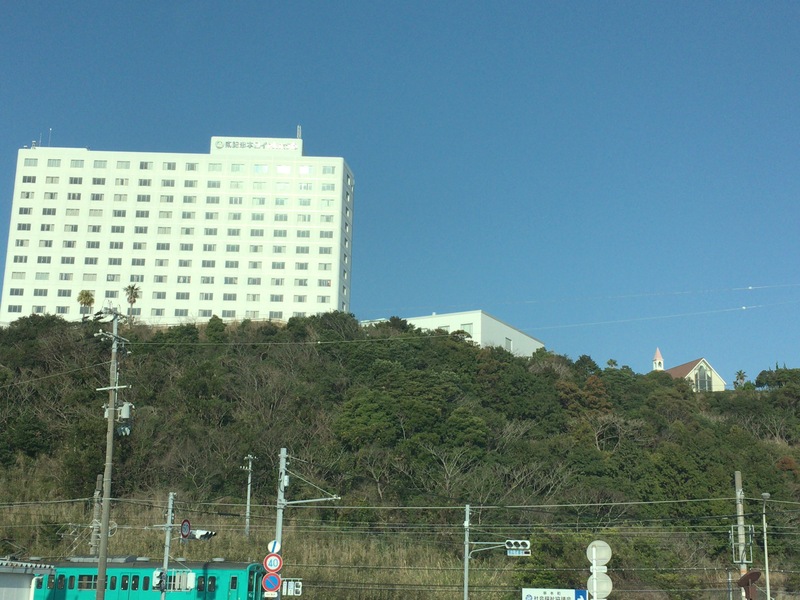 She took me to a nice Japanese restaurant Izama at Mitsui Garden Hotel Shinmachi Bettei, Kyoto. I absolutely enjoyed food, drink and chatting! 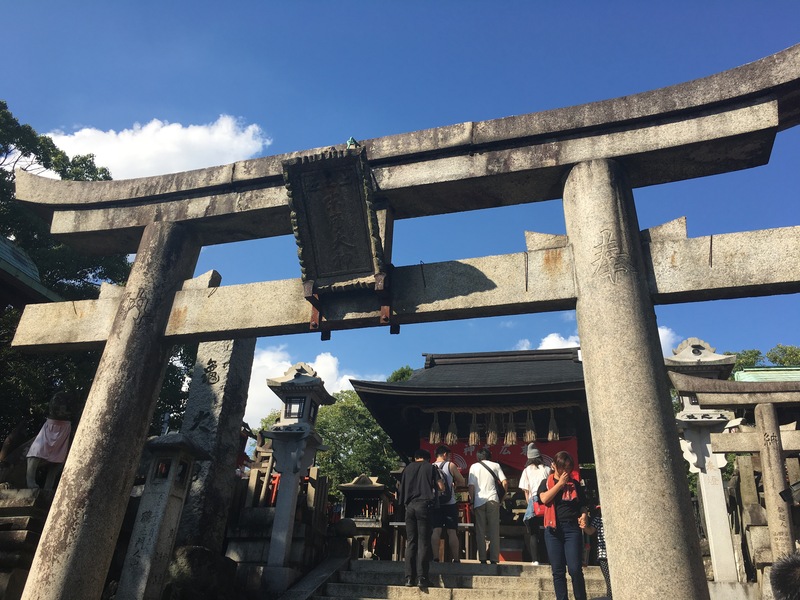 I had a long weekend because I took a day off on Friday and our office is closed on Monday: Japanese National Holiday, Sports and Health Day. 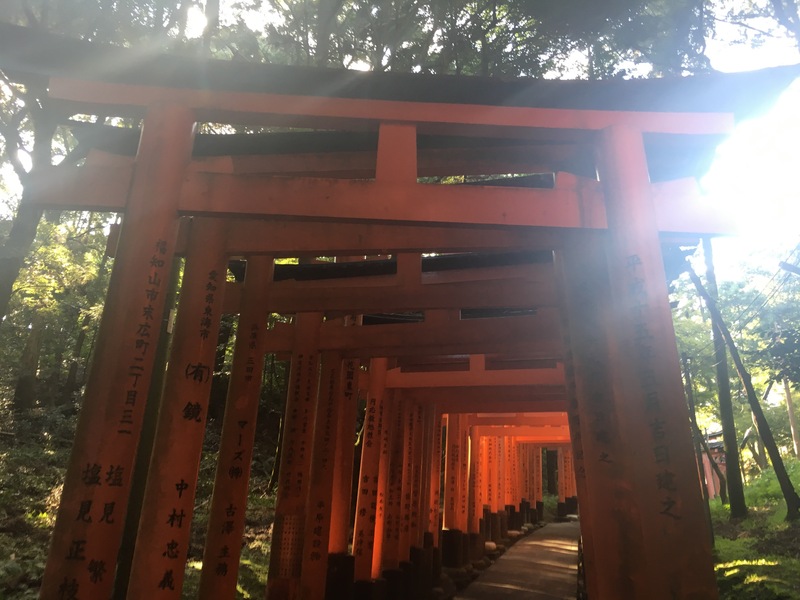 I decided to come to Kyoto. 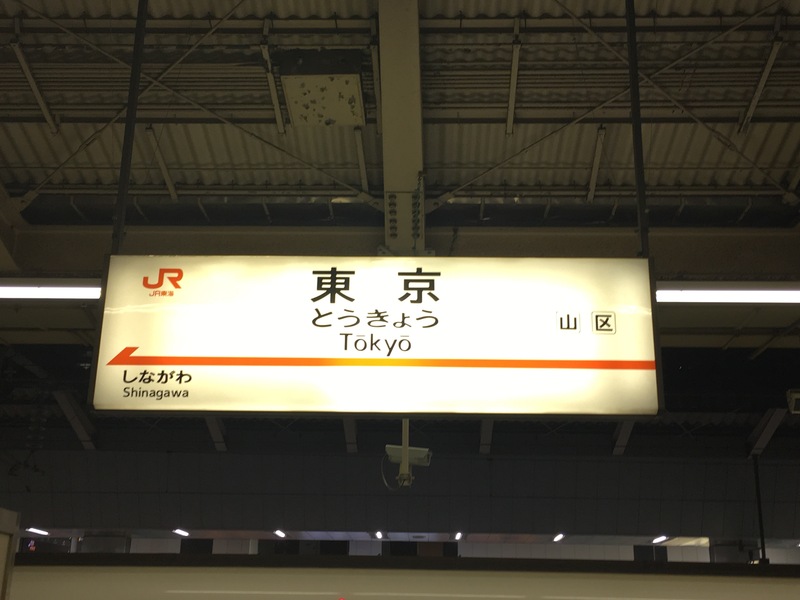 Kyoto is popular sightseeing place for Japanese and foreign tourists; therefore, Shinkansen (bullet train) is full. 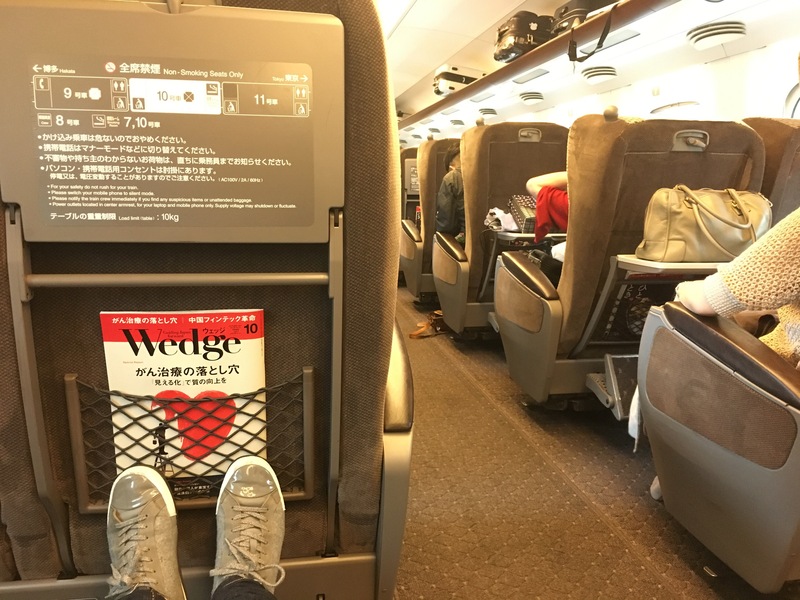 I listened to the announcement that the Shinkansen is full and all seats are taken. I managed to get few last seats. 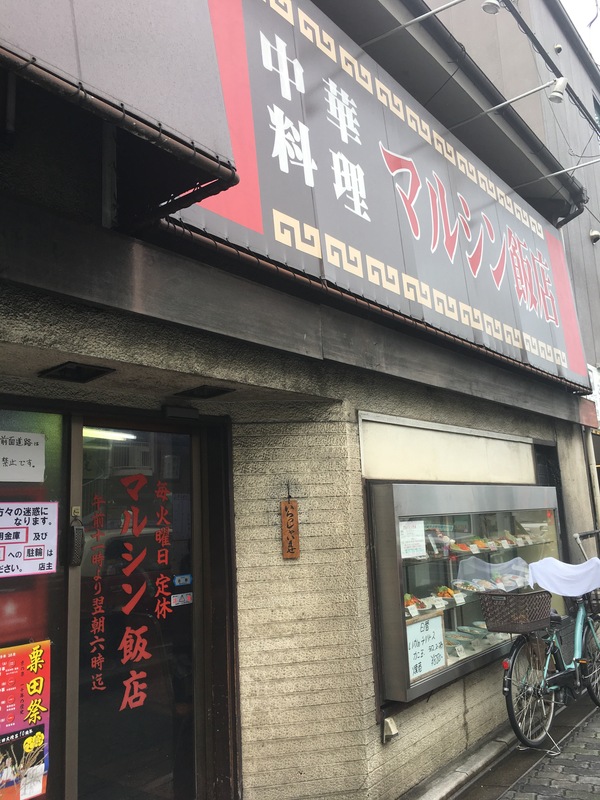 First, I went to Chinese Restaurant: Marushin Hansen for lunch. 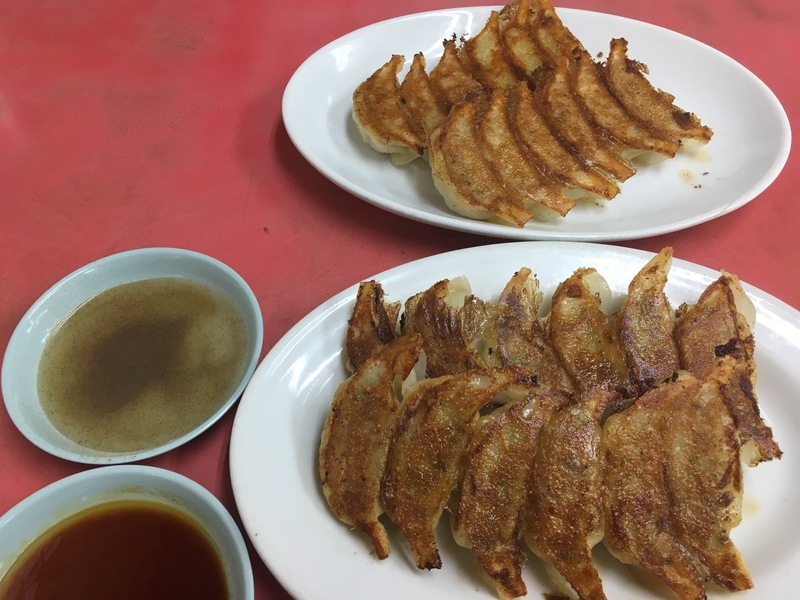 This restaurant is famous for Gyoza (fried dumplings) and Tenshinhan (rice with egg). 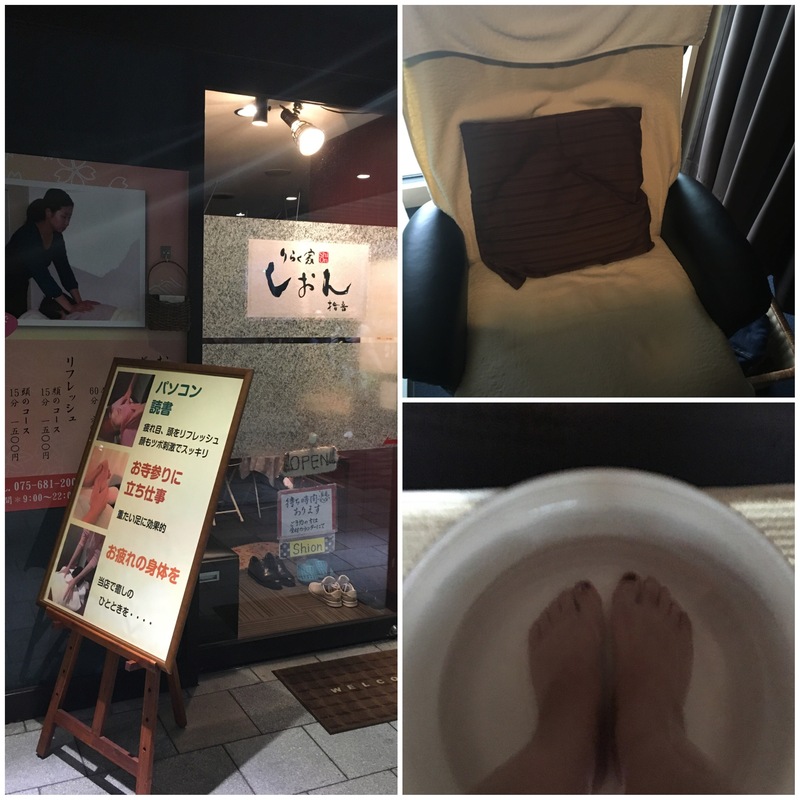 Then went to foot massage at Shion, Kyoto Station. I felt so good because my body was exhausted! 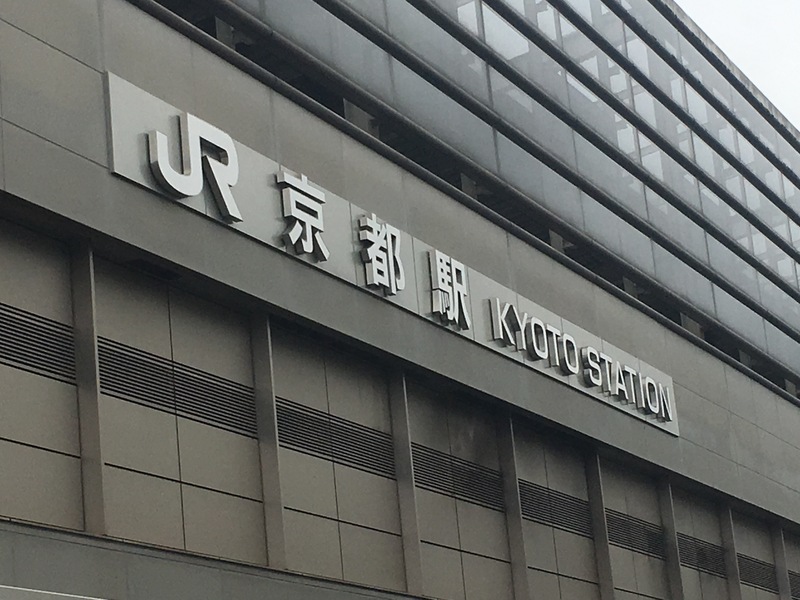 When you arrive Kyoto Station early and don’t know what to do, you can go for a quick massage, quick as 15 mins and they are good! 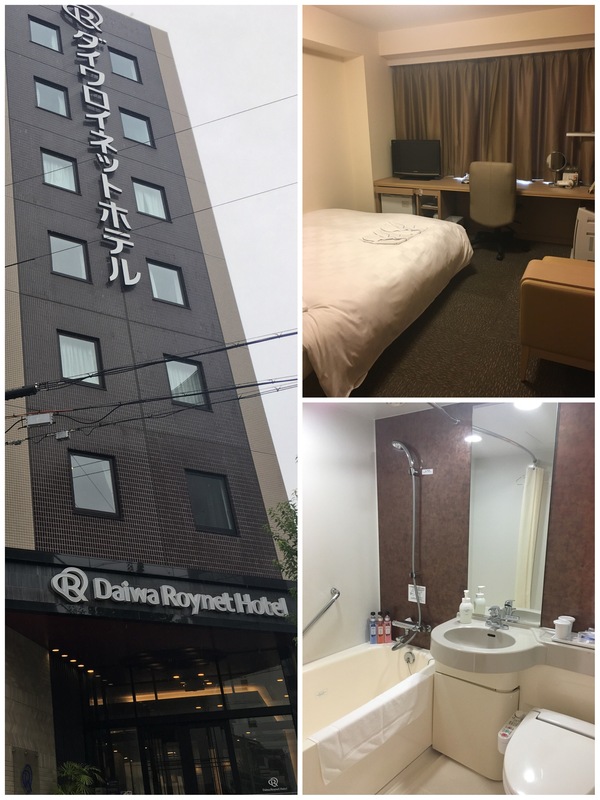 Checked in at Daiwa Roynet Hotel Hachijo Guchi, Kyoto. 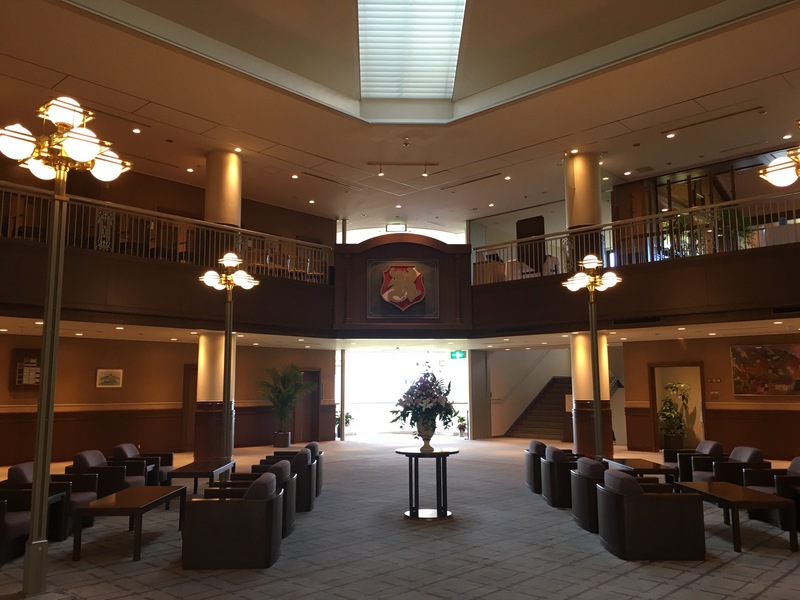 It’s conveniently near to Kyoto Station, Subway Kujo Station and Bus Stop. 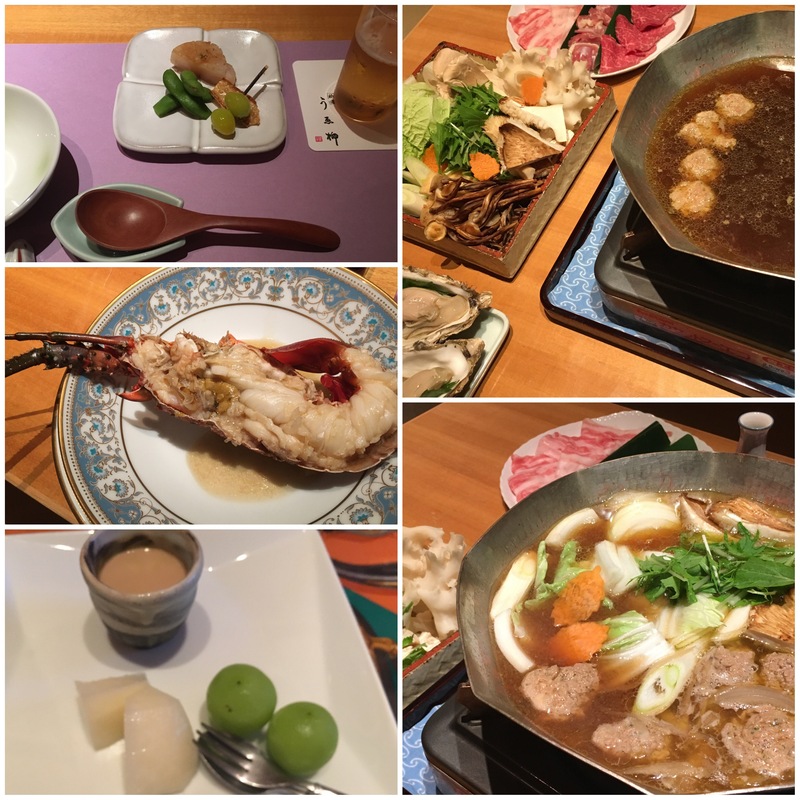 I had Chanko Nabe (put anything into soup/pot) for dinner. 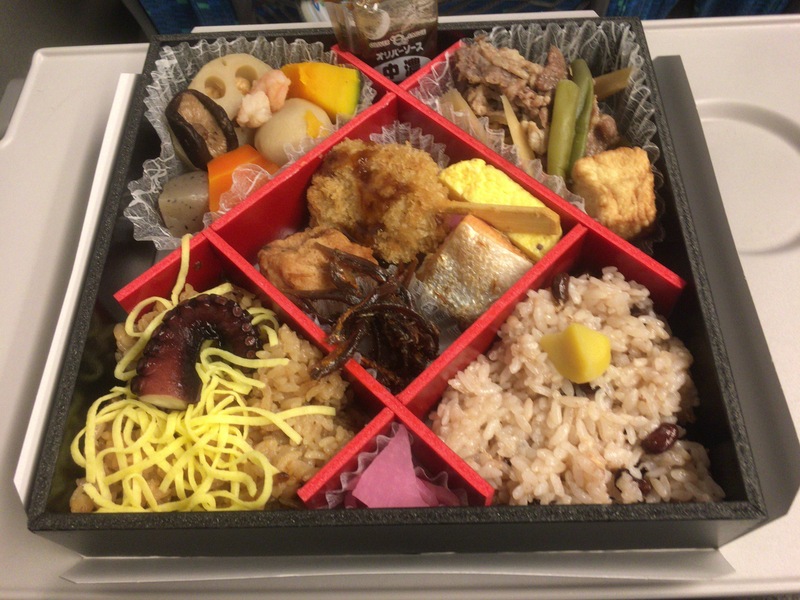 There are varieties of mashroom (autumn seasonal vegetable), vegetables, pork, chicken, beef, oyster, ise ebi (lobster) and udon noodle. 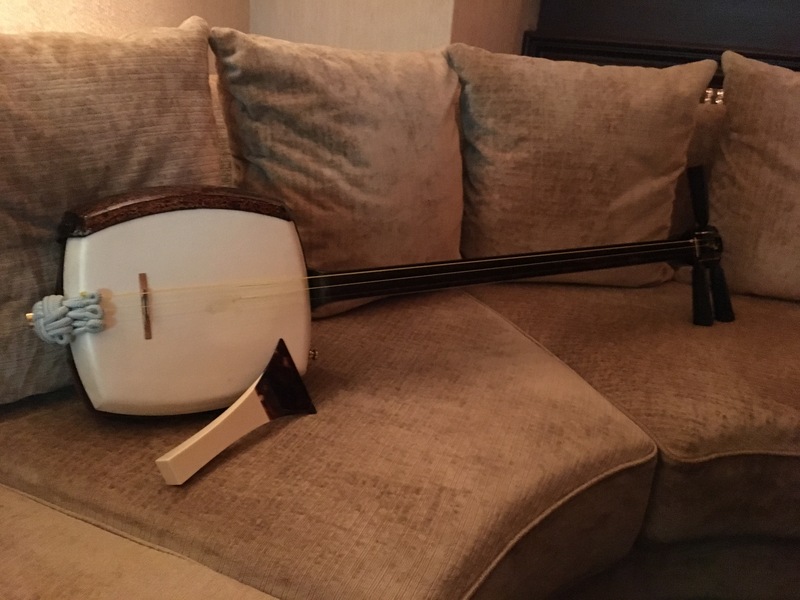 After dinner, I listened to Tsugaru Jamisen (Japanese guitar). 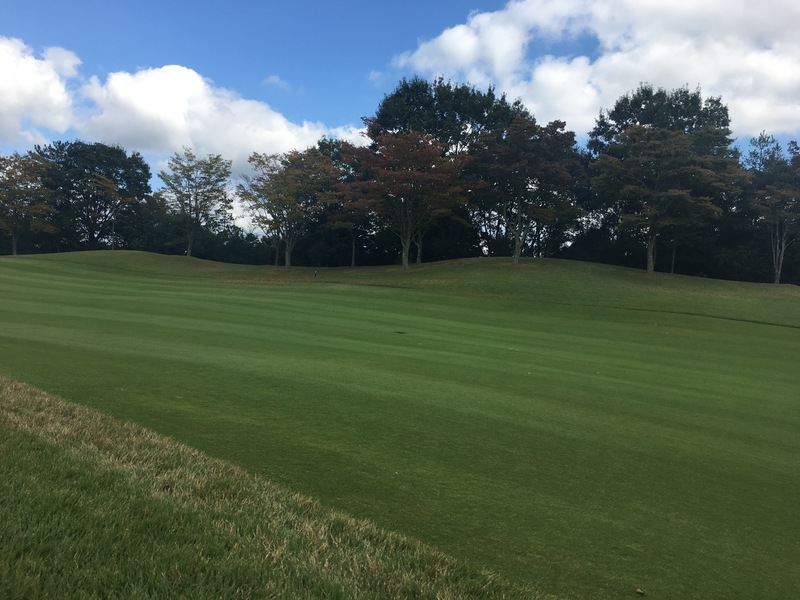 The next day, I played golf at King’s Road Golf Course. 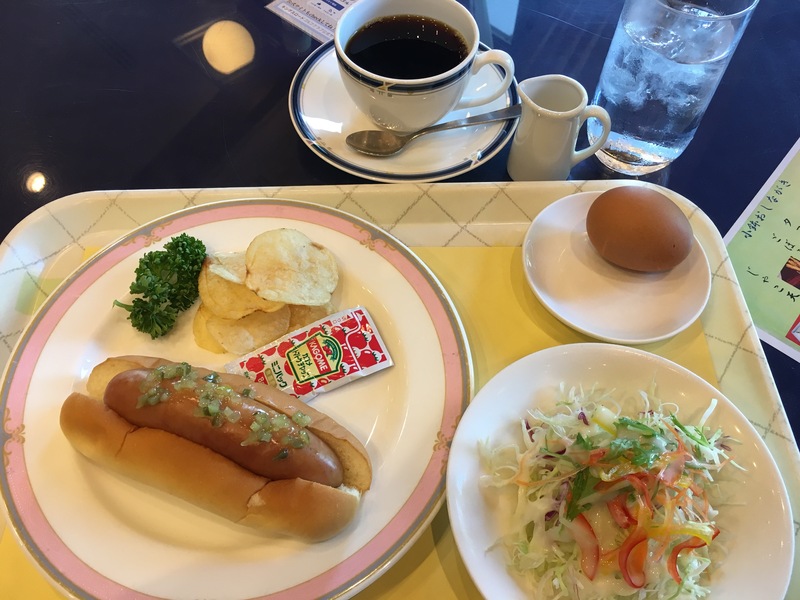 I started with breakfast because we left hotel early. 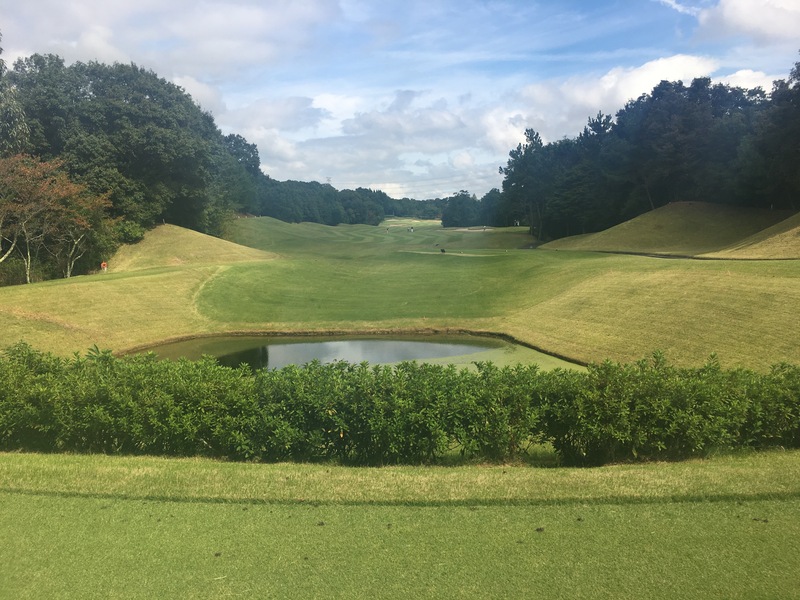 But there is no regret because it’s a nice course to play. 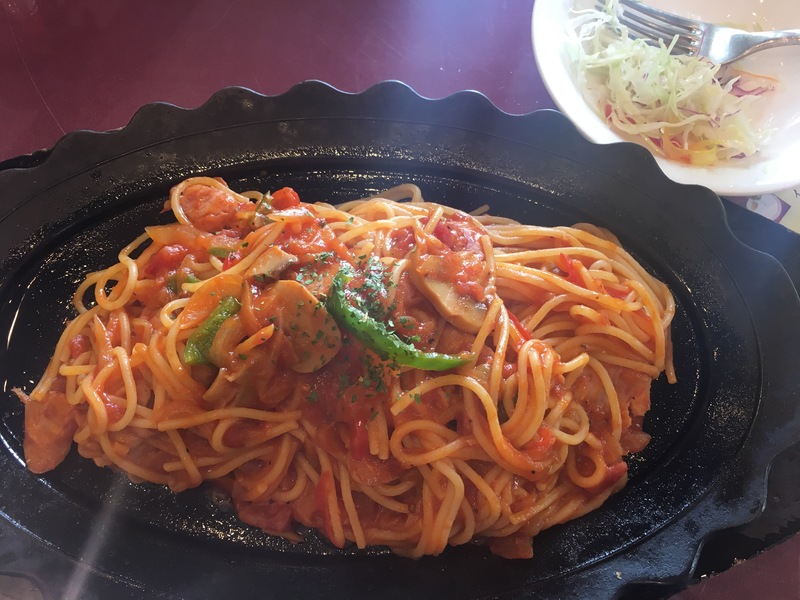 I had a Japanese traditional spaghetti, Neapolitan, for lunch. 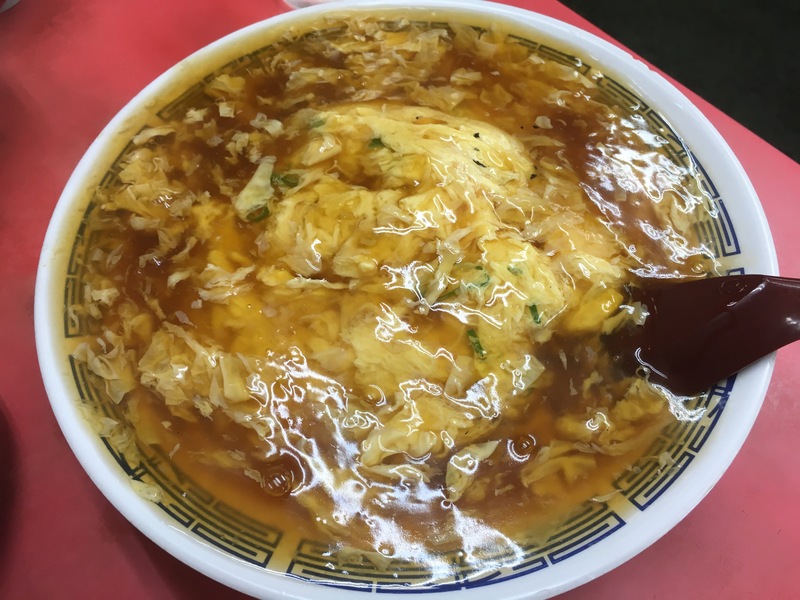 This is one of Japanese modified western food. 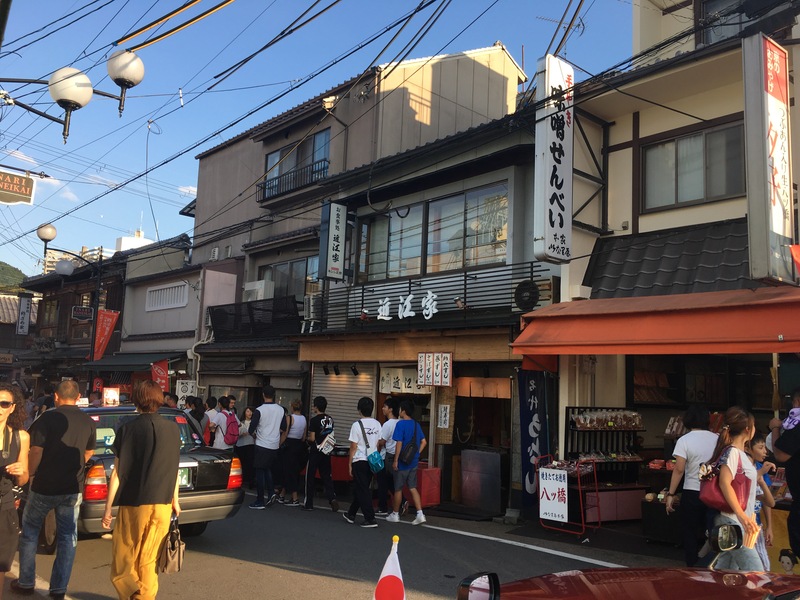 After a game, returned to Kyoto and went to Gion Negiyaki Kana Higashi Ten (Higashi Store), Gion, Kyoto for dinner. 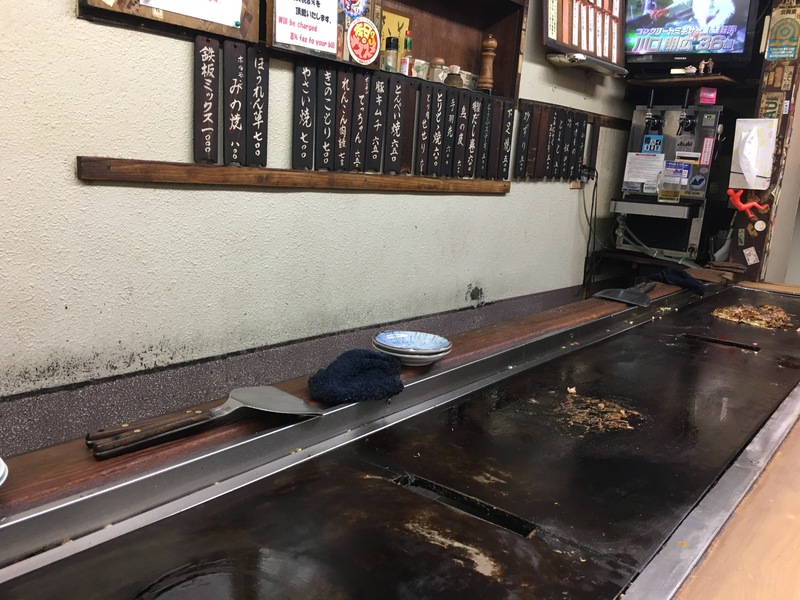 The restaurant is nice and cozy with a traditional Teppan (grill plate). 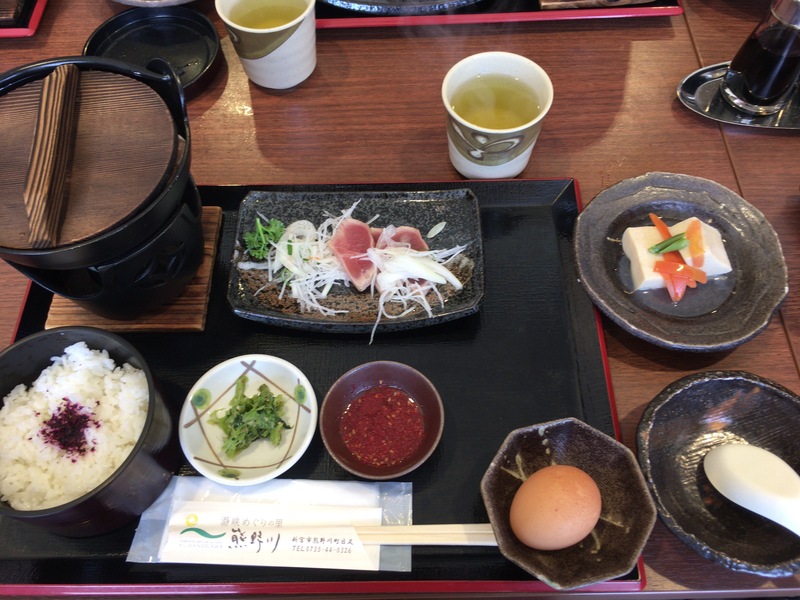 These are typical Kansai Food (Osaka Food); therefore, I can enjoy these at other restaurants. However, if you want to enjoy the atmosphere, it’s nice. 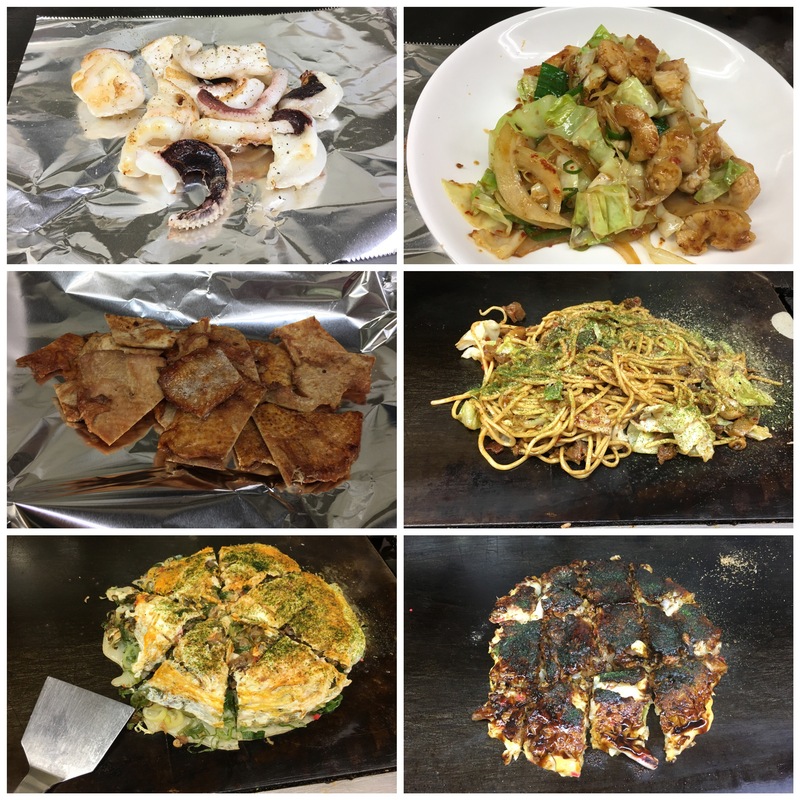 If you are new to Negiyaki (Japanese pizza or shall I call it, pancake? with Negi (leeks), it’s okay. I woke up late on Monday and got ready to go out. 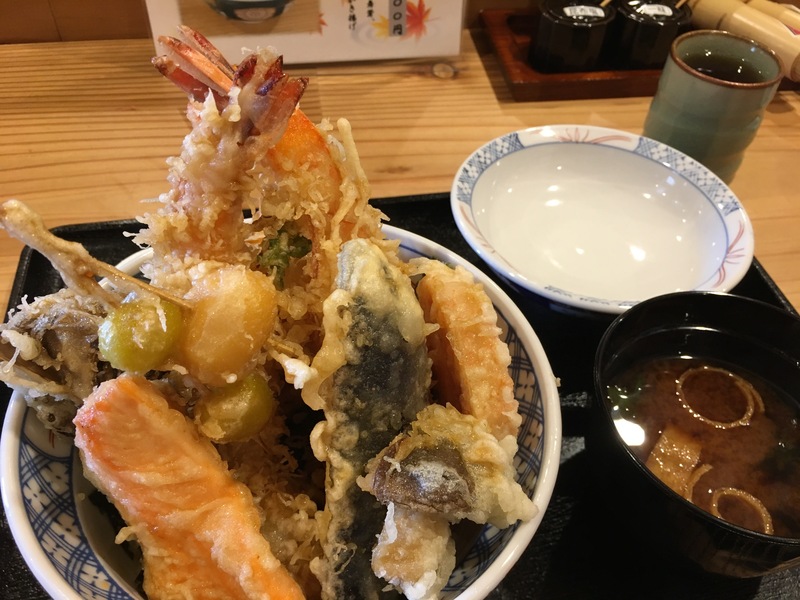 I had seasonal tendon (tempura bowl) at Fushimi Tenpura Oe, Fushimi, Kyoto for brunch. 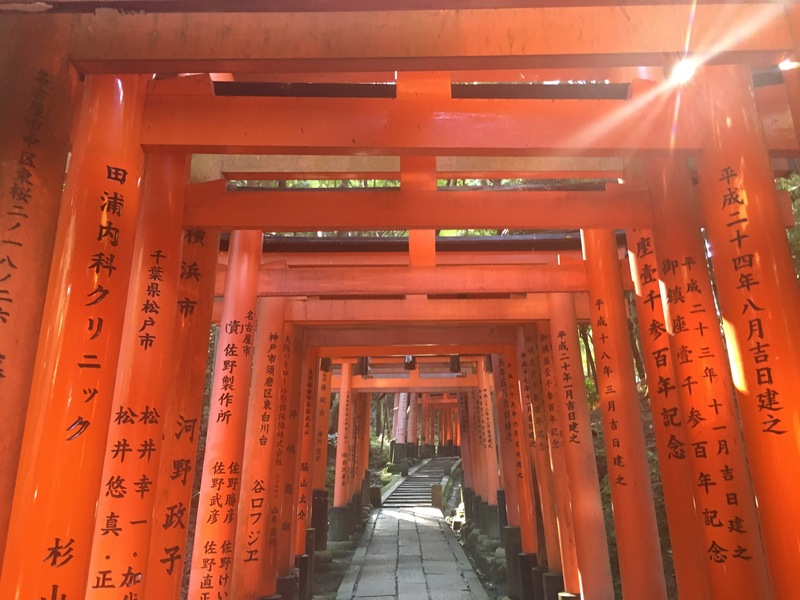 I want to go to Fushimi Inari Taisha. 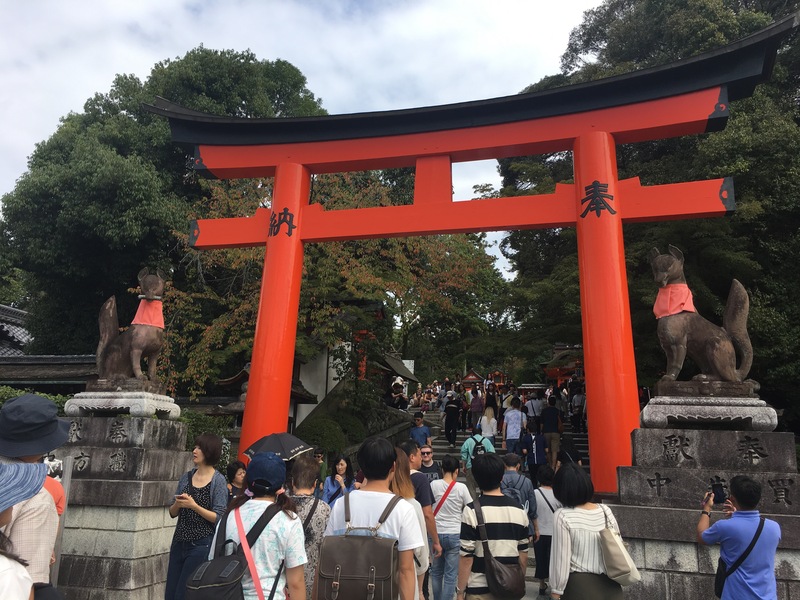 Today, it’s a popular place for Instgram, known for Sen-bon Torii (1,000 red shrine gates) and the place could be crowded. By the way, I need to warn you; you should wear a pair of comfortable shoes to climb up stairs to go up to the summit. 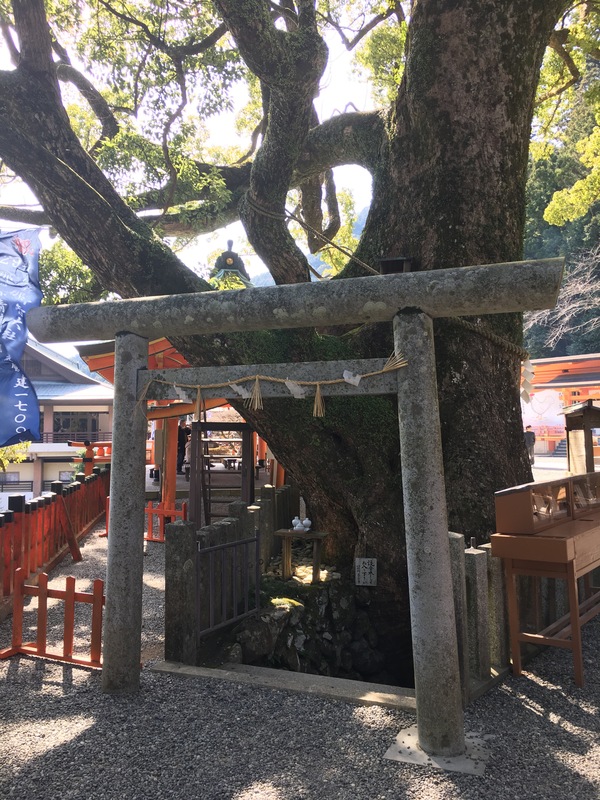 It’s hot today so I sweat a lot; but I feel better after exercising and praying at many shrines. It’s proven I’m detoxed because I pulled Daikichi (the luckiest) for omikujo (fortune tell). 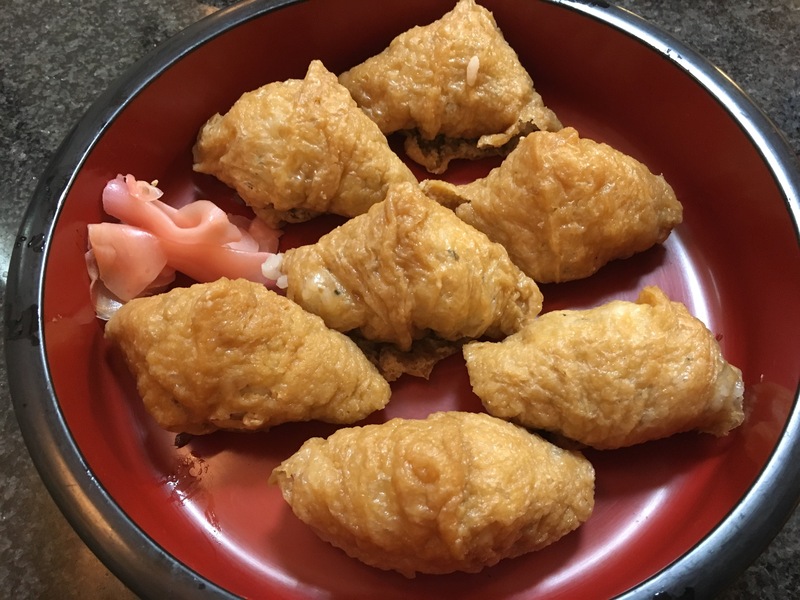 After a good exercise and pray, I had early dinner, Oinari (fried tofu with marinated rice) at Omiya, Fushimi, Kyoto. 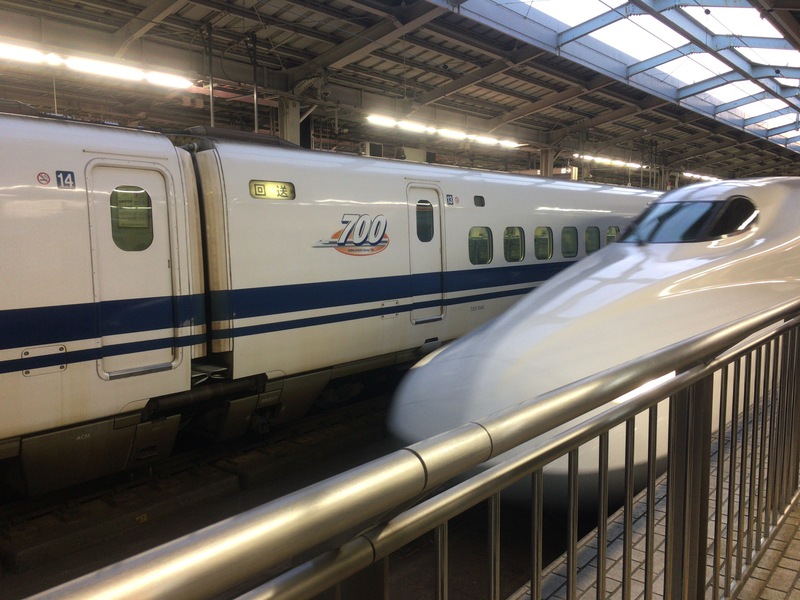 I purchased a Shinkansen ticket online. 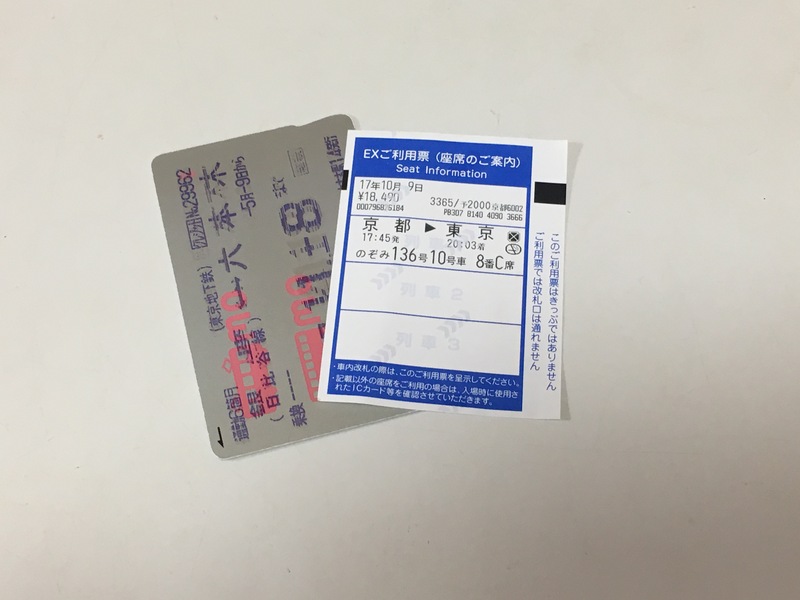 Central Japan Railway Company introduced a new service allowing to purchase a Shinkansen ticket online by registering IC train or subway card and credit card. I don’t need to queue on a line to purchase a ticket. However, again, Shinkansen is packed so I can reserve only one hour later Shinkansen. 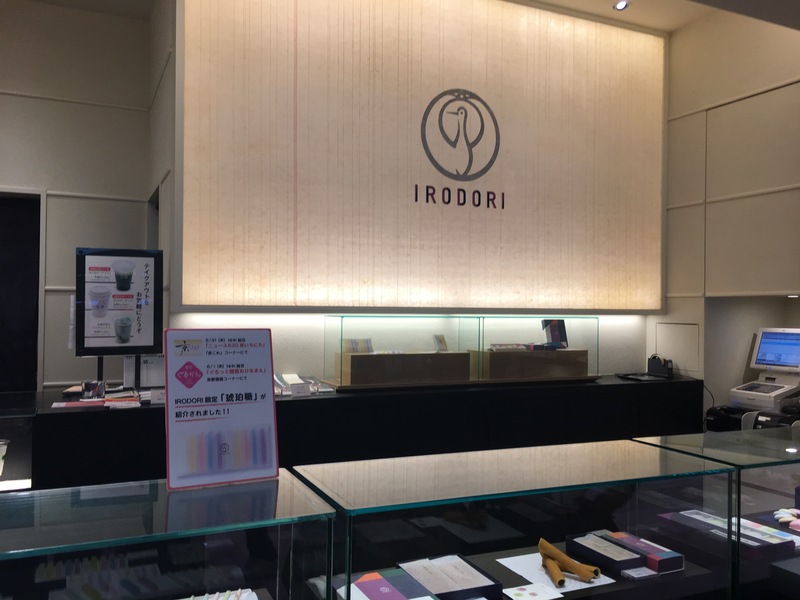 I didn’t have a green tea during this Kyoto trip so I went to Japanese traditional sweet manufacturer, Tsuruya Yoshinobu’s cafe: Irodori, Kyoto Station for green tea and Anmitsu (Japanese traditional dessert – Jelly). 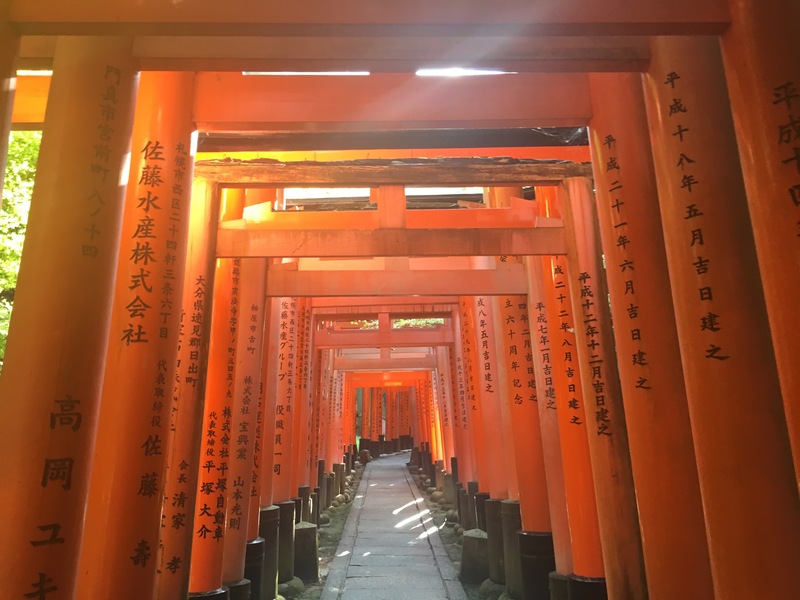 I very much enjoyed this time’s sudden and short trip to Kyoto. 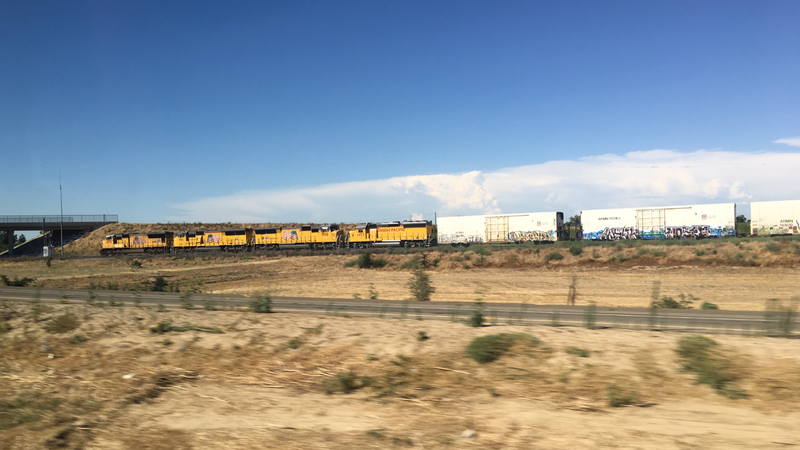 It seems many cargo trains passed by last night; but I didn’t wake up till my alarm went off. I woke up feeling fresh this morning. 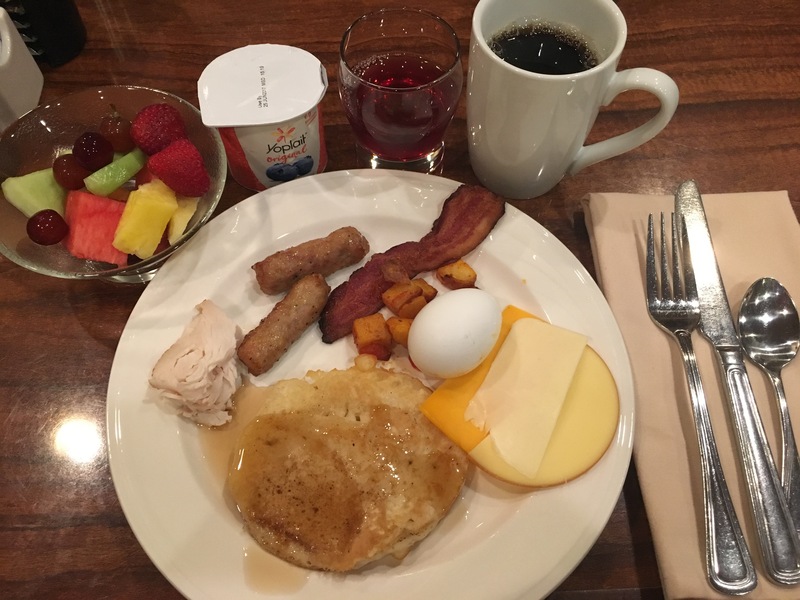 I had a typical American breakfast: egg, sausage, beacon, turkey ham, cheese, pan cake, yogurt, fruit and Starbucks coffee! 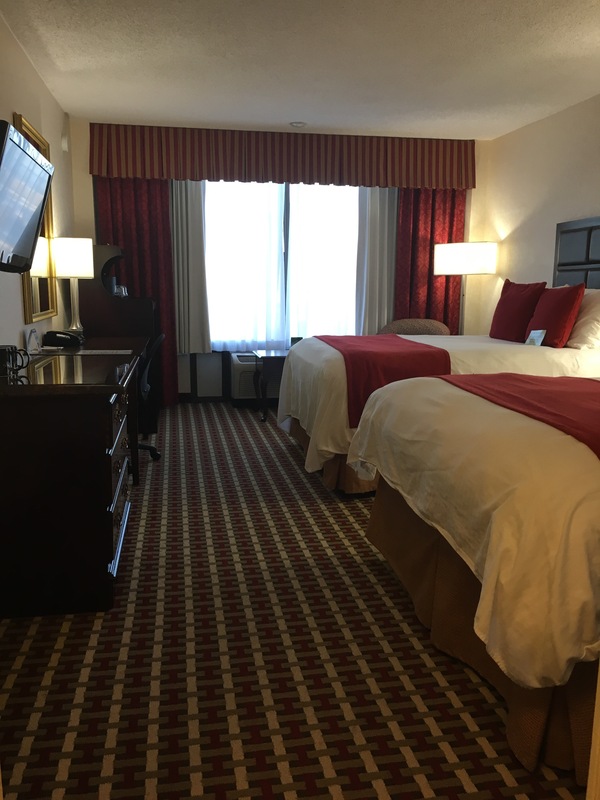 I departed Double Tree by Hilton Modenas for Yosemite National Park. Yosemite is Native Americans (Indians) language meaning Brown Bear. A bus is climbing mountains. 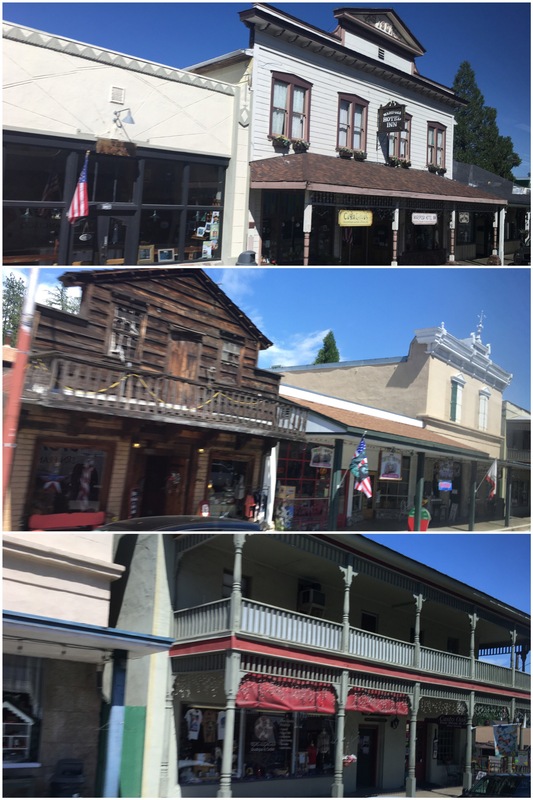 On the way to Yosemite, we drove through Mariposa, which was a gold mining town in 1848 at the time of the California Gold Rush. 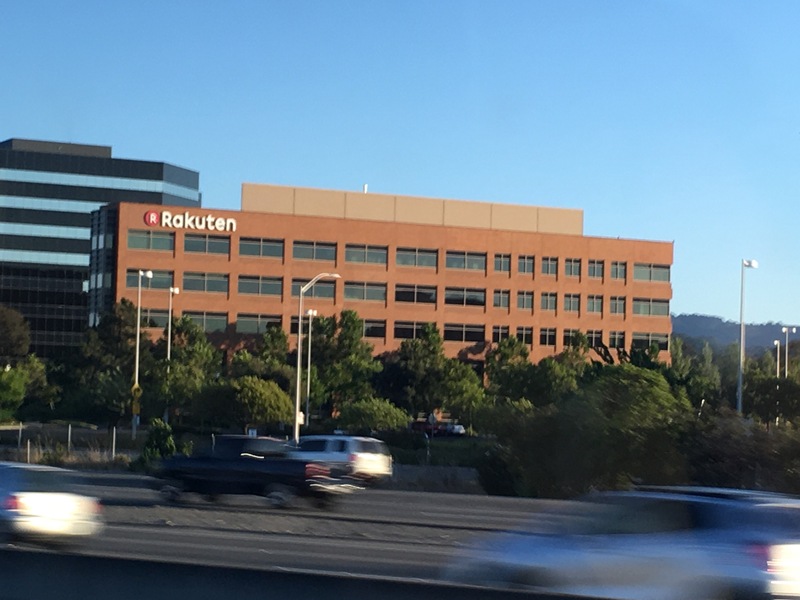 Many speculators rushed to California to look for Gold especially in 1849; therefore, they are called 49ers which now named for American football team, San Francisco 49ers. Players are definitely “49ers” because they also rush for an opportunity (ball) to make them famous and wealthy. 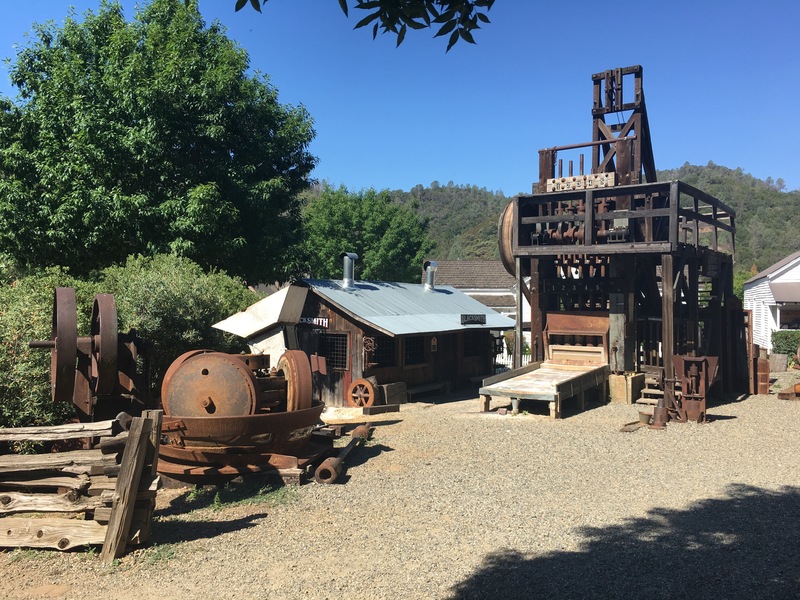 This town didn’t die after the California Gold Rush era died because the town became a resting area before reaching Yosemite. The town preserves cowboy town look. This is how they mined gold. 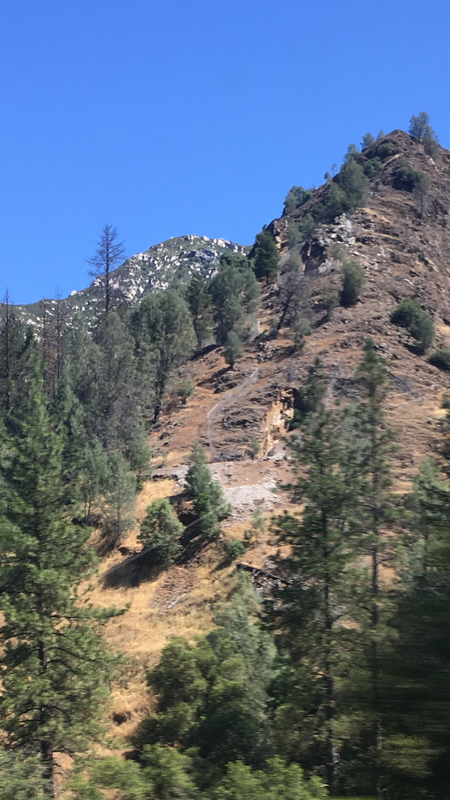 On the way to Yosemite, I could see old mining points. 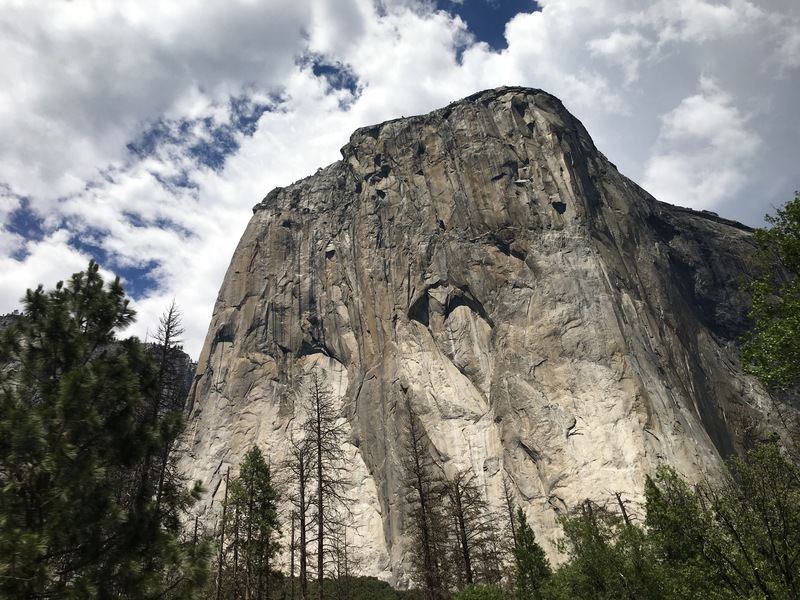 It took over 3 hours to reach the Arch Rock Entrance of the Yosemite National Park and also the Unesco’s World Heritage. 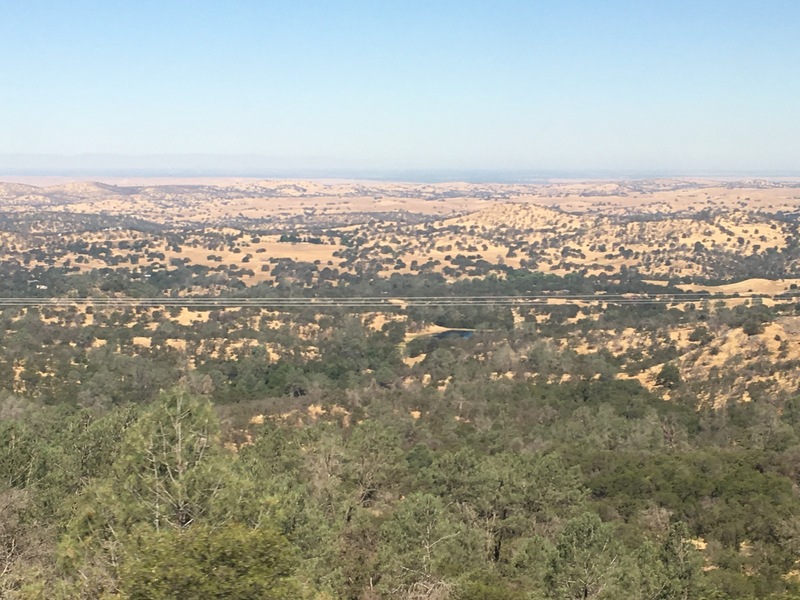 I am lucky because I was told that past 7 – 8 years it didn’t rain enough so waterfalls and rivers were thin and some points dried. 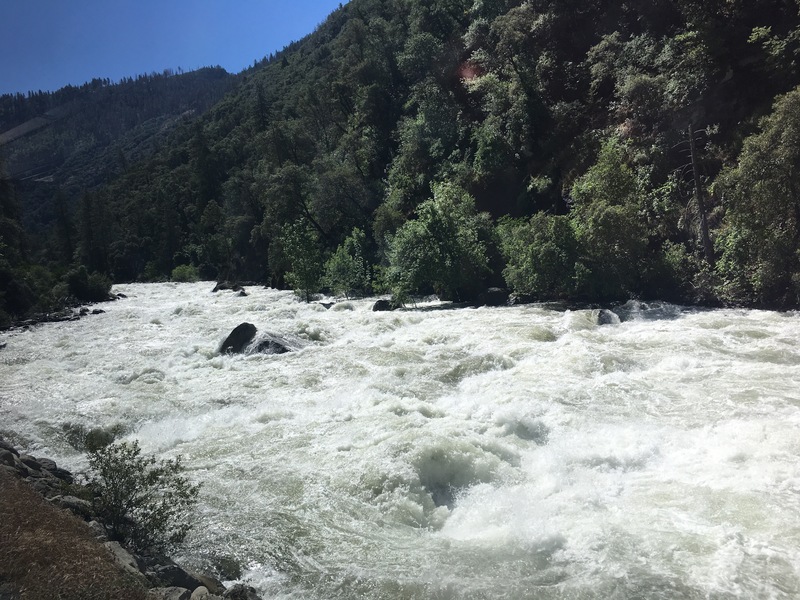 However, last year it rained well so I could enjoy powerful waterfalls and rivers today! 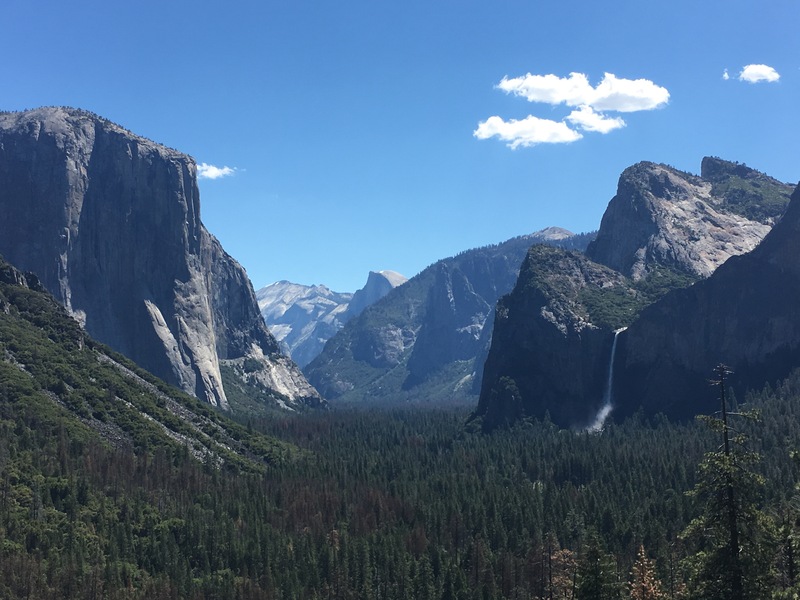 At the Tunnel View point, I overlooked the Bridalveil Falls (on the right), Half Dome (a peak in the center) and El Capitan (solid granite mountain which is popular for rock climbing on the left). From a different point, we can take a look at Ribbon Fall next to El Captan. And moved to another point to have a close look of Bridalveil Fall. 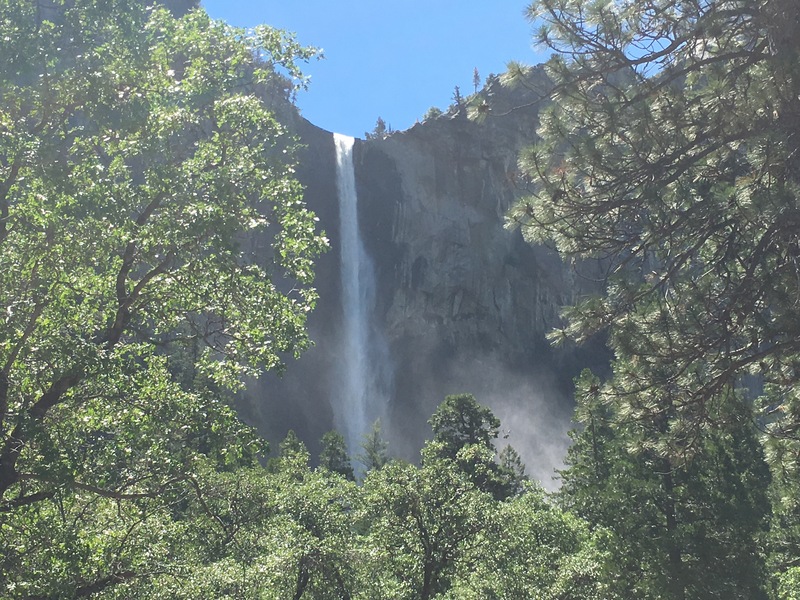 This fall named Bridalveil because at the bottom of the fall, the mist looks like as if bride’s veil is flipping by wind. 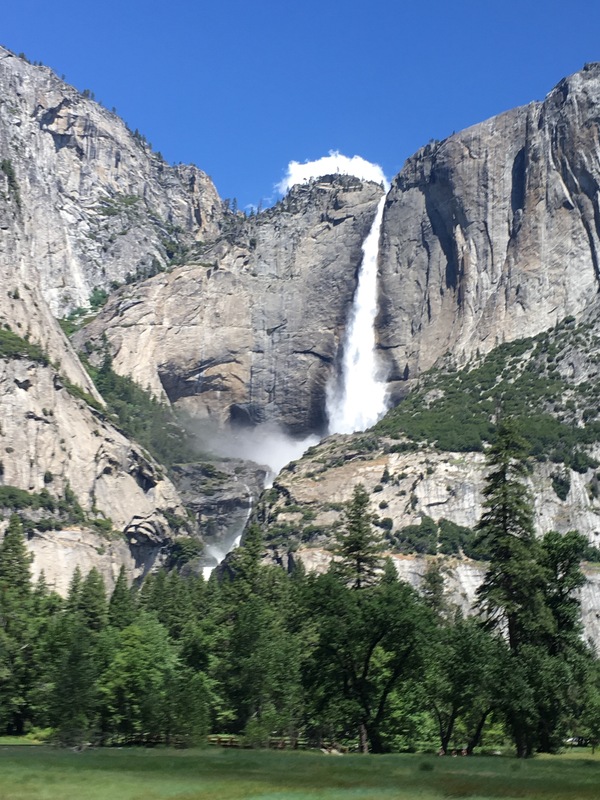 This dynamic cascade fall is 740 m length Yosemite Fall. 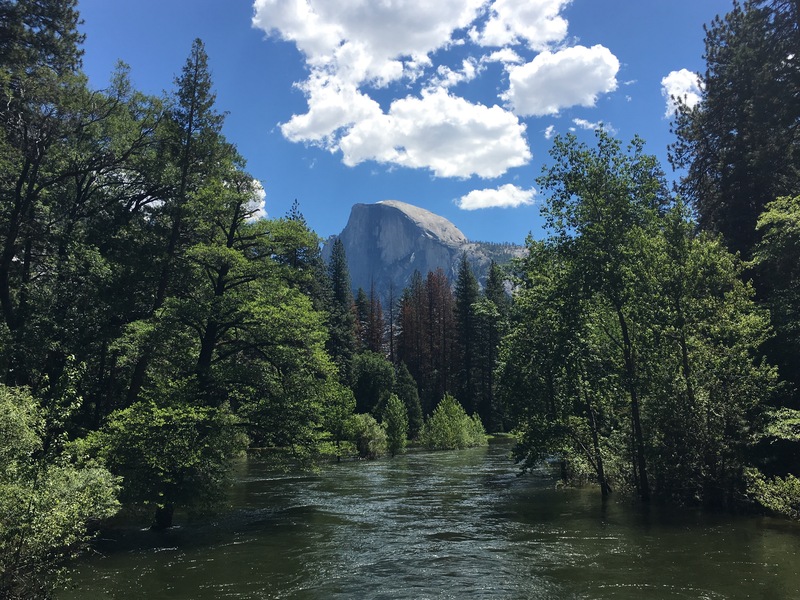 From the different point, I enjoyed peaceful looking Half Dome. 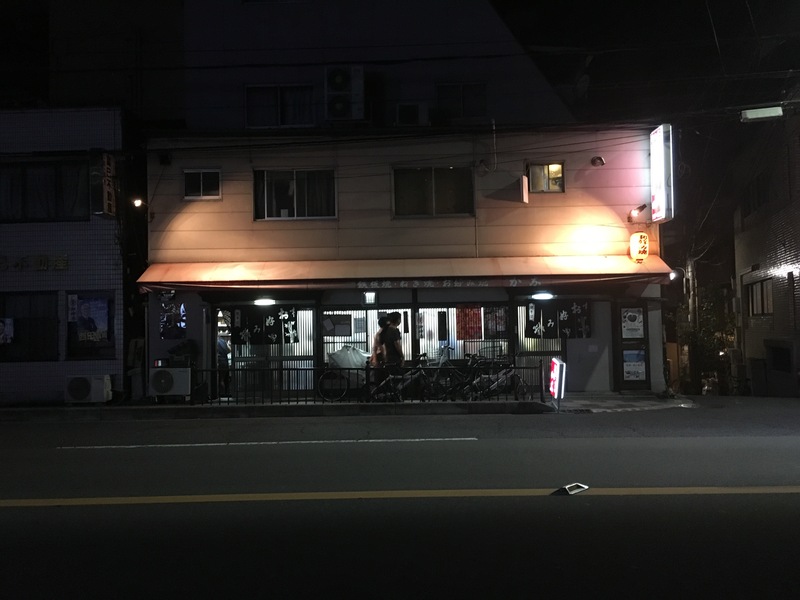 After viewing iconic points from different places, I became hungry. 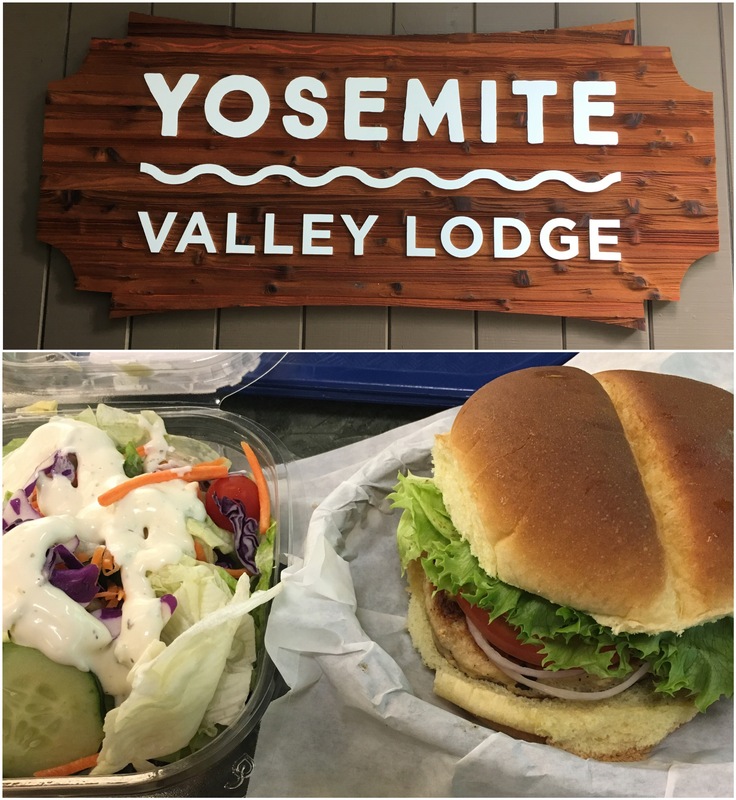 I had a turkey burger (not a sandwich) and salad with ranch dressing at Yosemite Valley Lodge. 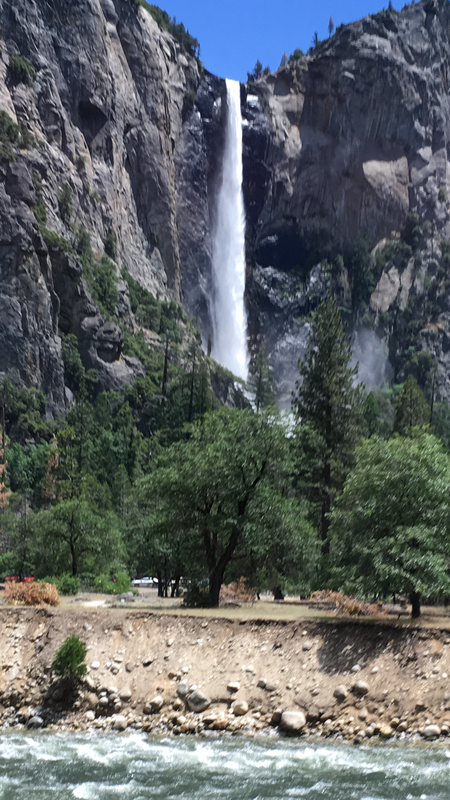 After lunch, I walked to the bottom of Yosemite Fall. 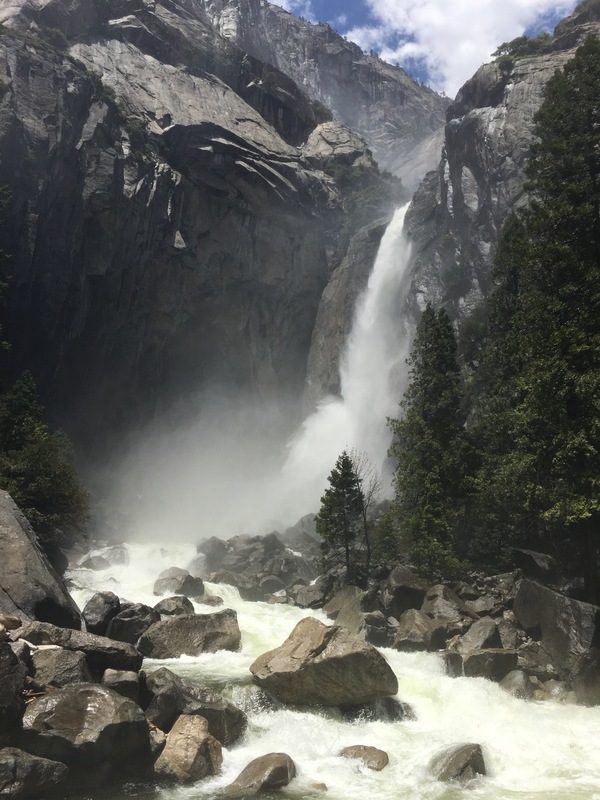 It’s so dynamic and powerful so I got wet at the bottom of Yosemite Fall. 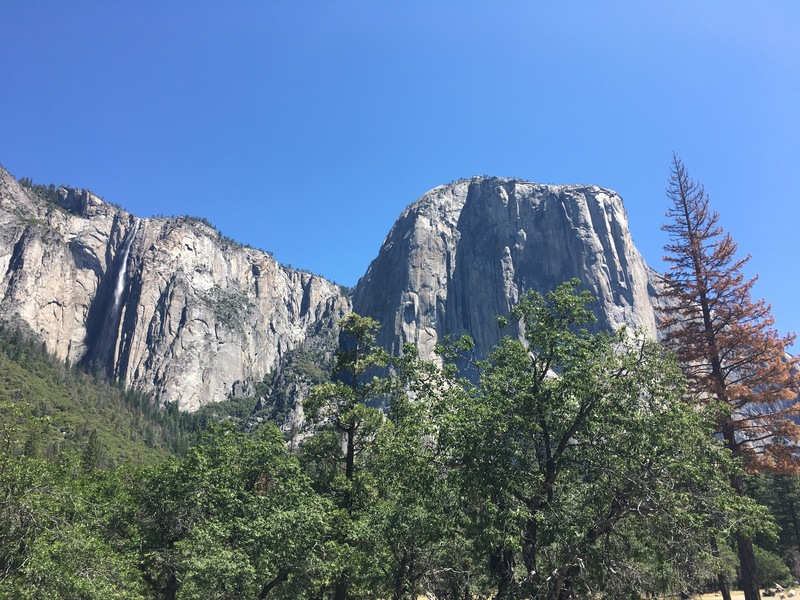 On the way out of Yosemite, I enjoyed closer look of El Capitan and Bridalveil Fall. 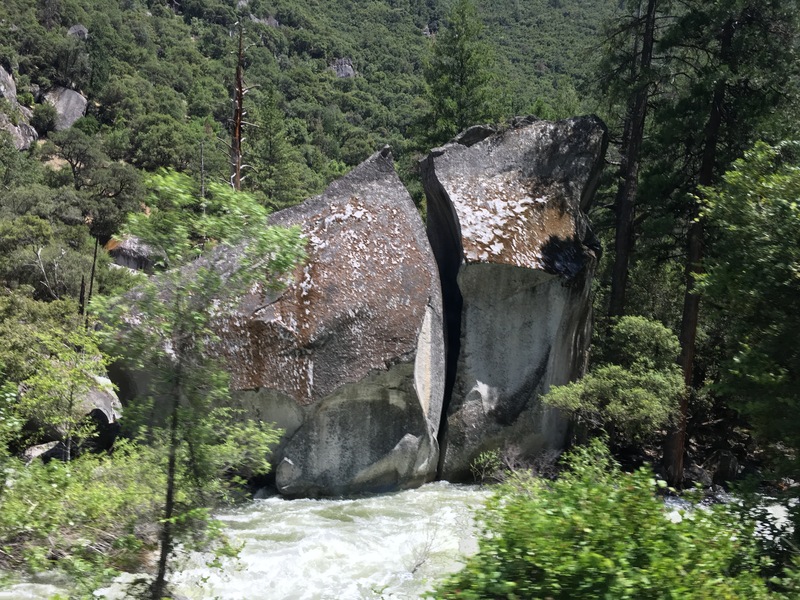 I could feel the great power of Mother Nature by looking at many huge rocks cracked in two like this as if somebody cut it by a knife. 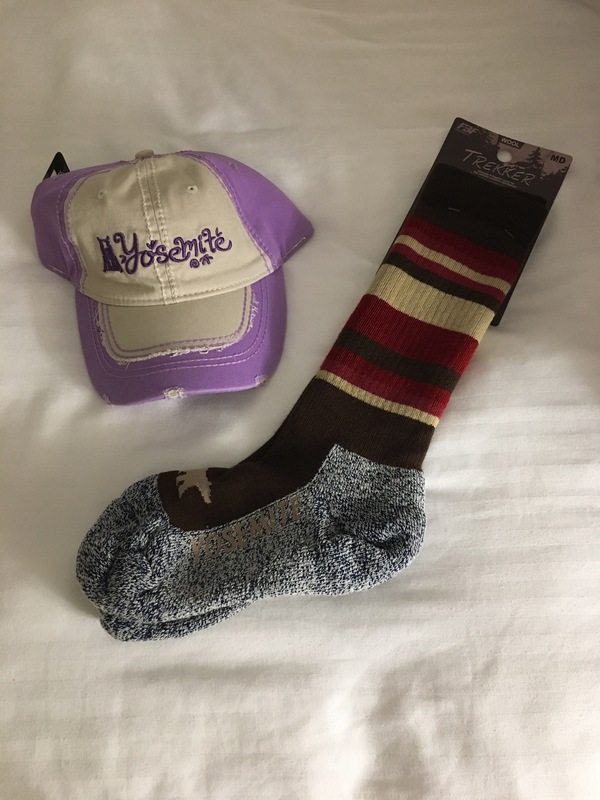 I bought a pair of socks and cap for the memory of Yosemite. Agriculture is one of major industries of California. 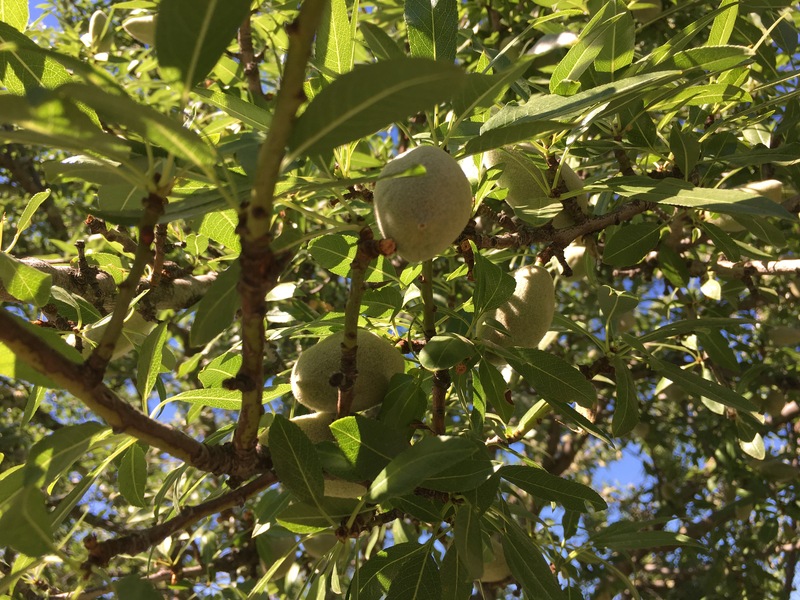 California is famous for production of almonds, pistachios and olive oil. 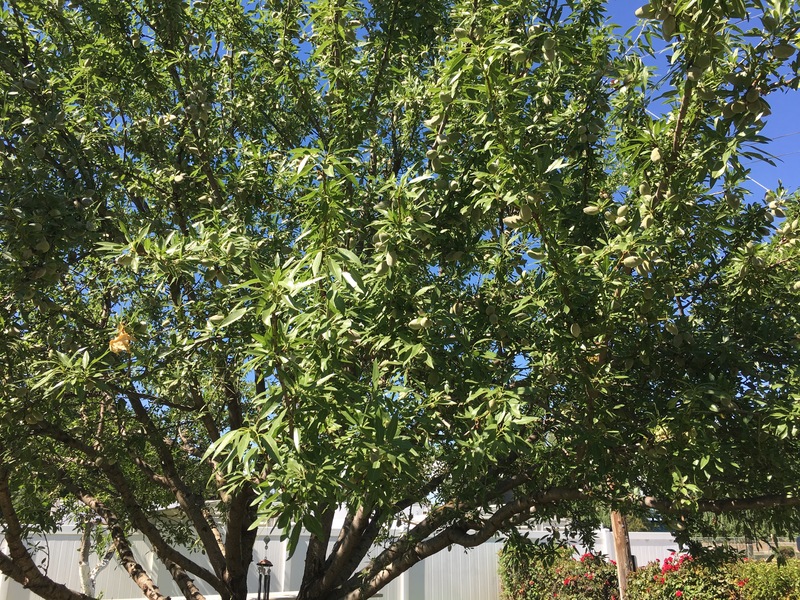 This is an almond tree. 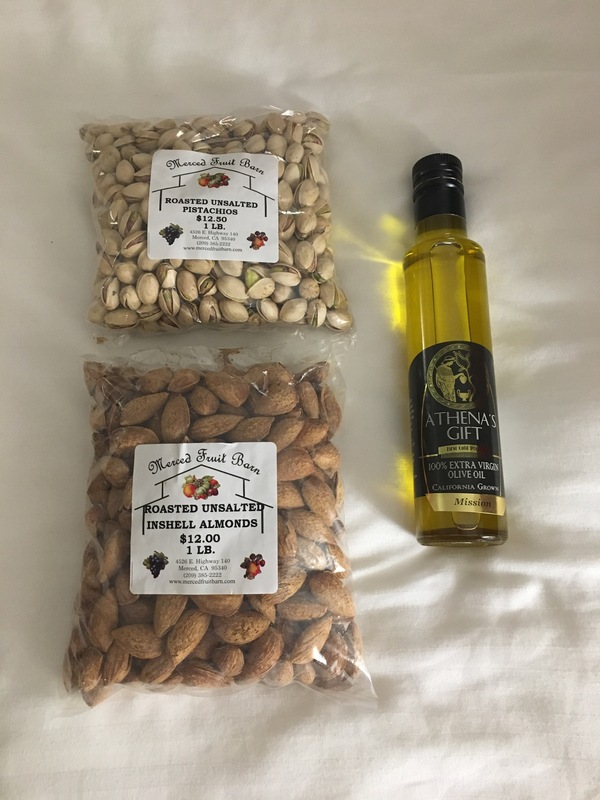 I bought these as my sourvenirs: Californian inshell almonds, inshell pistachios and olive oil. 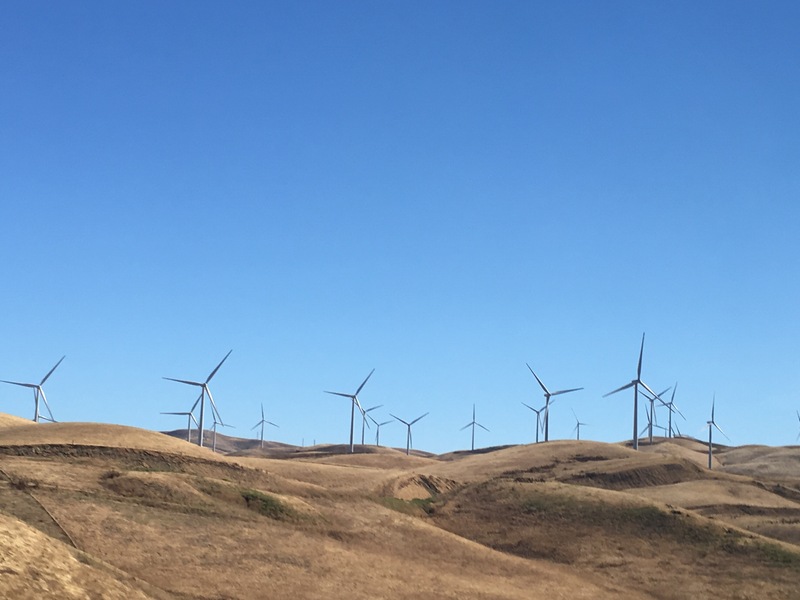 Not only shopping, but I also enjoyed window views such as Wind Power Station (there are many as 300) and trains (could be over 100 cargo containers). 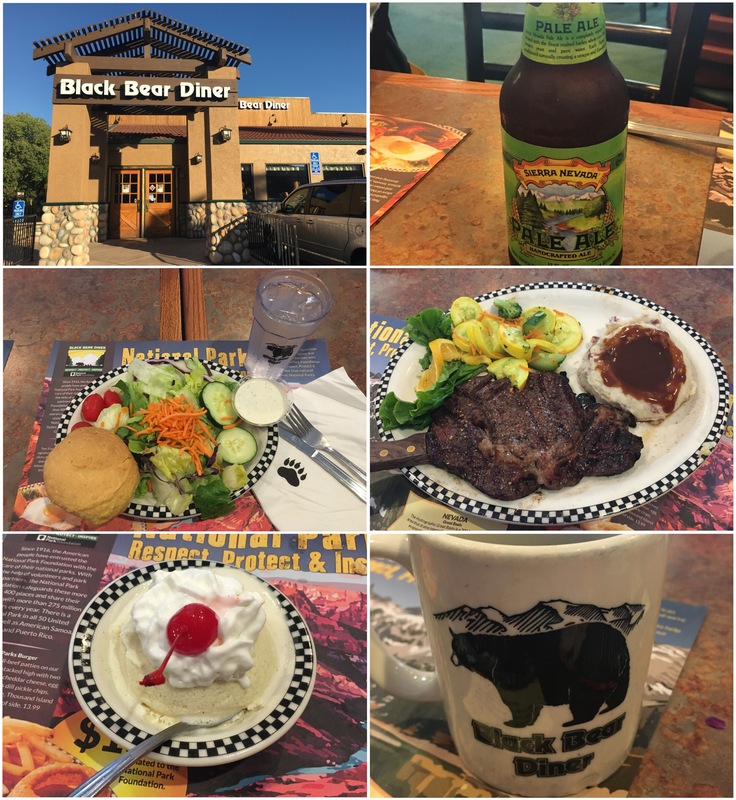 Before reaching to the hotel, I had a nice over 200 g rib eye steak and local beer, Sierra Nevada, at the Black Bear Diner. Salad, corn bread, ice cream and coffee are also nice. Restaurant is so cute, fully decorated with black bears! 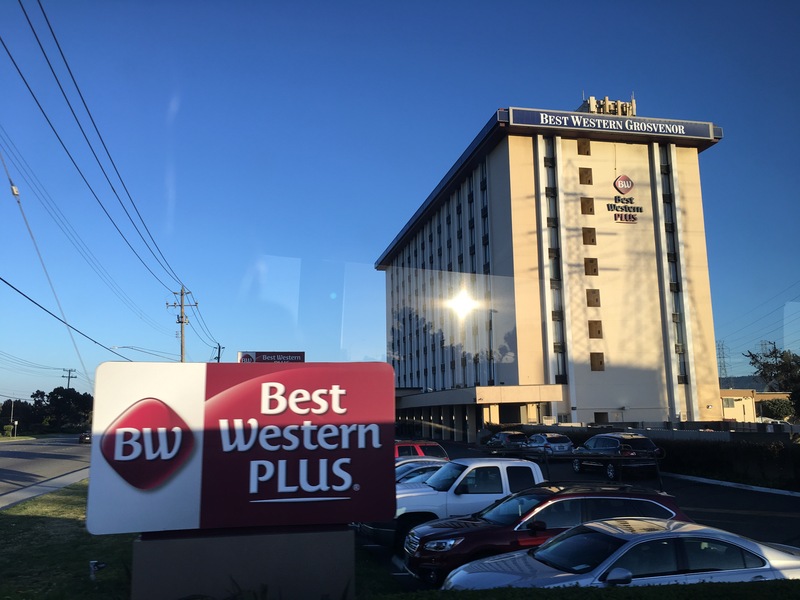 After a nice dinner, passed by Rakuten (Japanese leading e-commerce platform with 30% market share follow by Amazon (15%) and Yahoo Japan (3.2%)) and reached tonight’s hotel: the Best Western Plus Grosvenor Hotel. 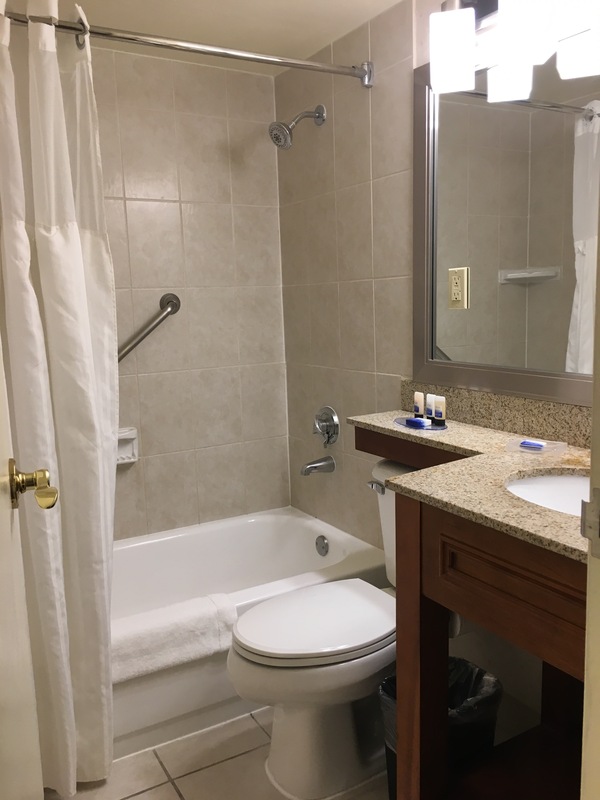 Okay, my bath is ready. 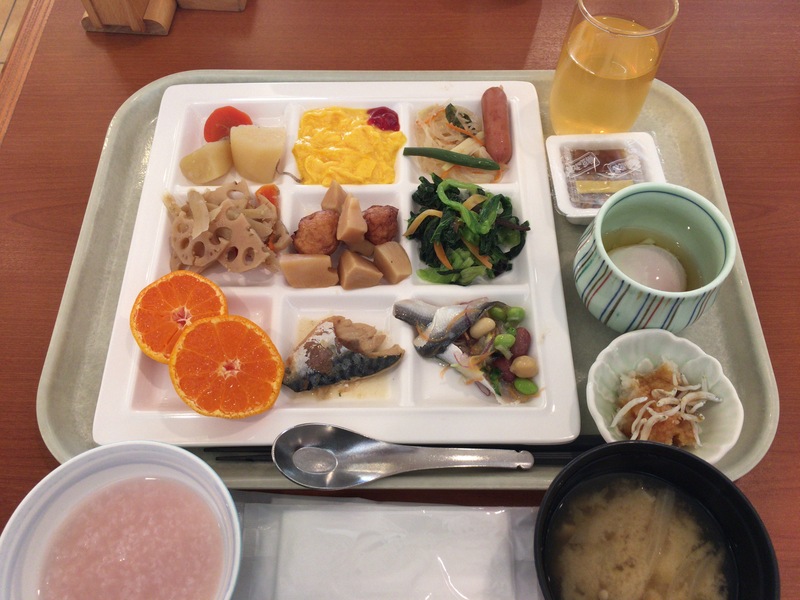 And I enjoyed varieties of food at breakfast. 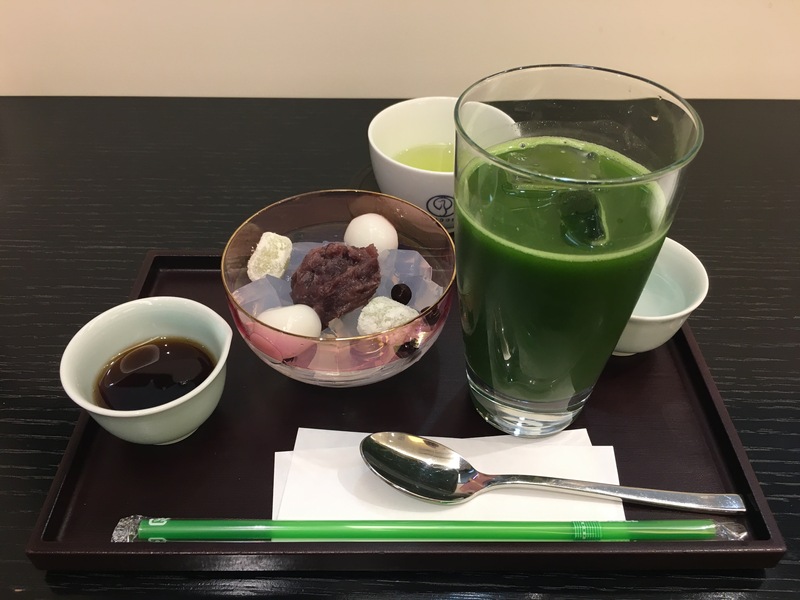 Wakayama is the largest production of sour plum in Japan; I tried my first sour plum porridge. 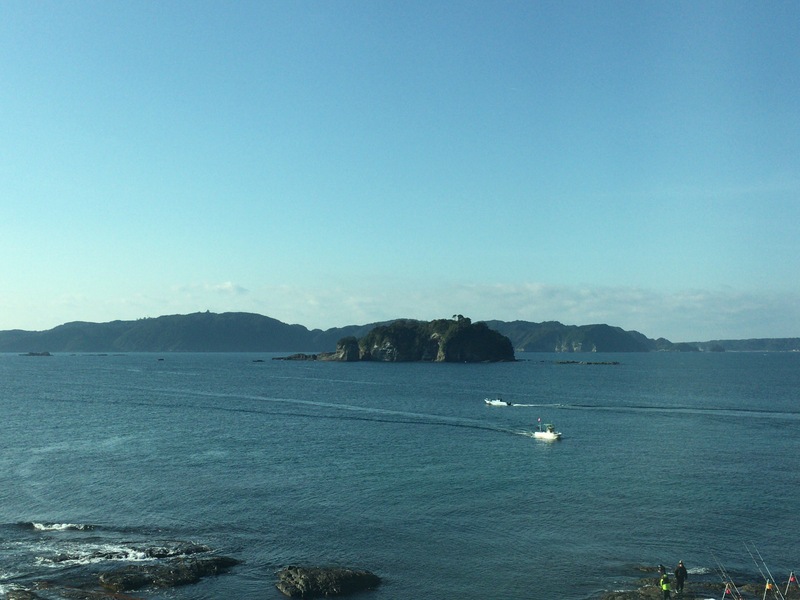 We are at the tip of the Kii Peninsula; therefore, we need to drive back over 200 km. We stayed in bus for long; but I enjoyed scenery from a window. 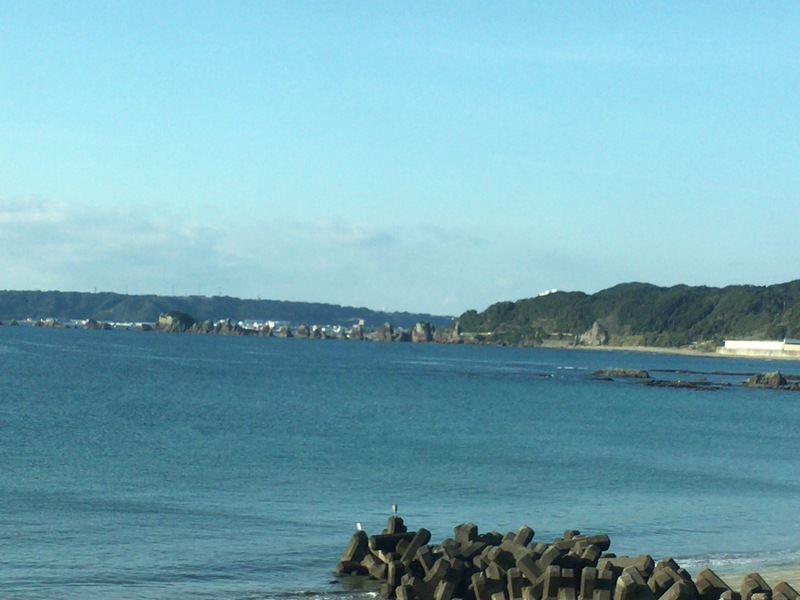 I looked at Hashigui from the other side. The scenery is so peaceful. 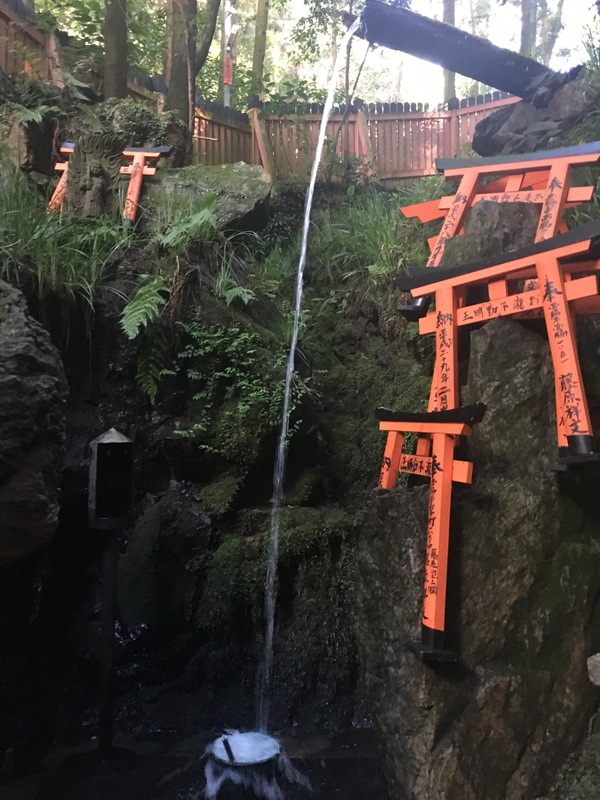 First we stopped at Nachi no Taki (Nachi Falls). 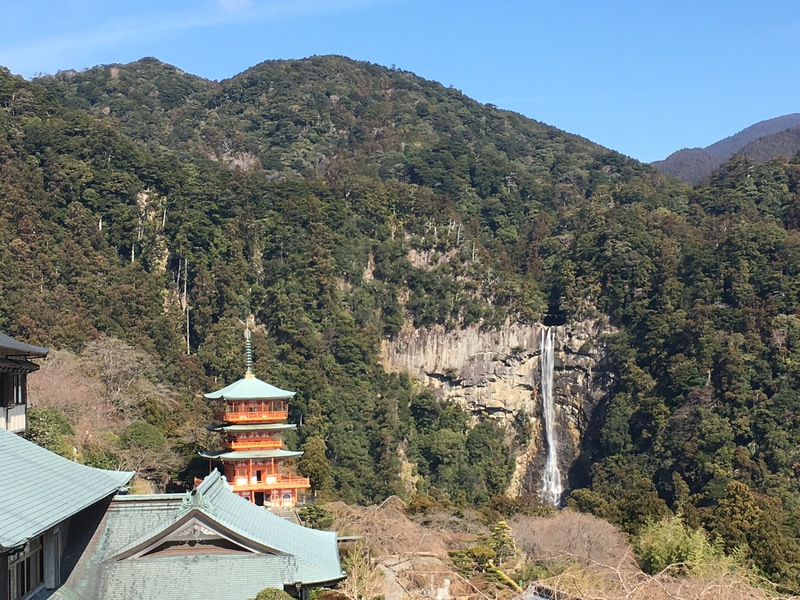 This is the tallest waterfall in Japan (133 m). This is the World Heritage Site. 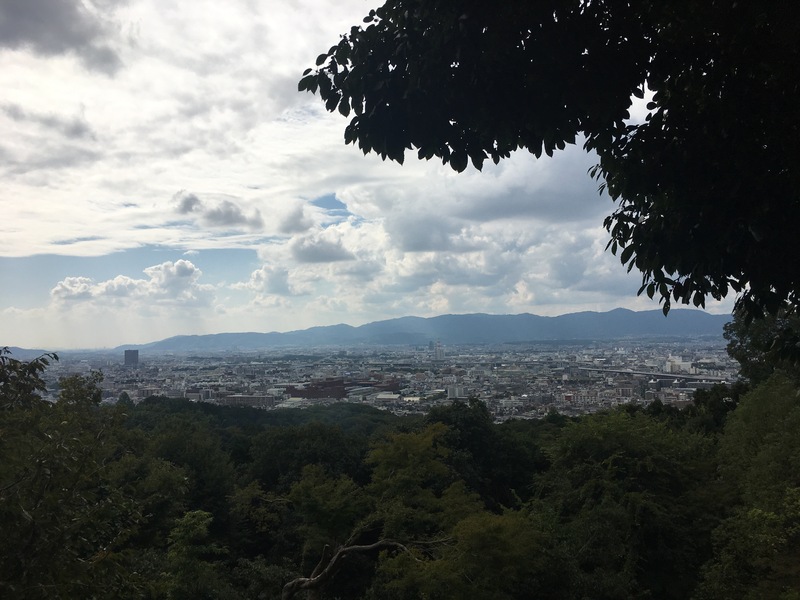 We can view Nachi Falls from here, too. 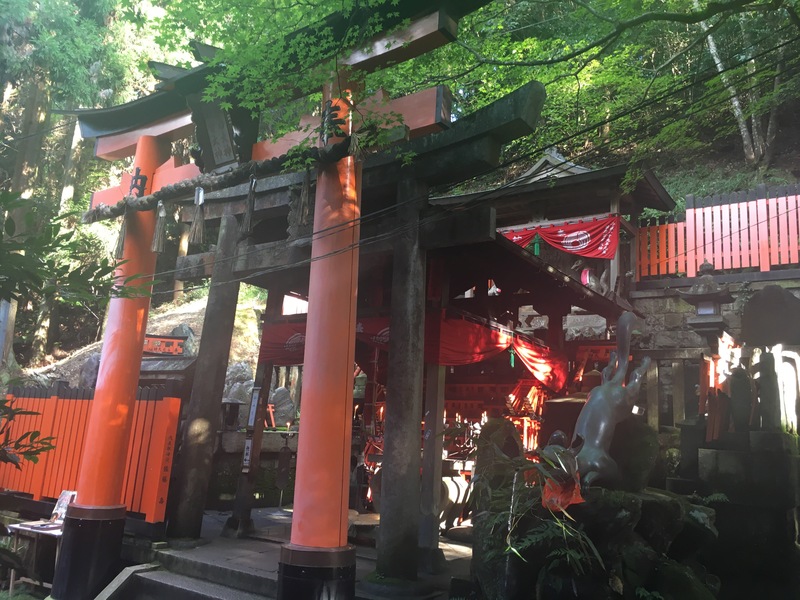 This temple is next to Kumano Nachi Taisha (shrine). There is a simple gate to divide the two. This Miagatahikosha is for safe travel and safe drive. Obviously, I love traveling so I need God’s blessing. In addition, Yatagarasu gets me excited. 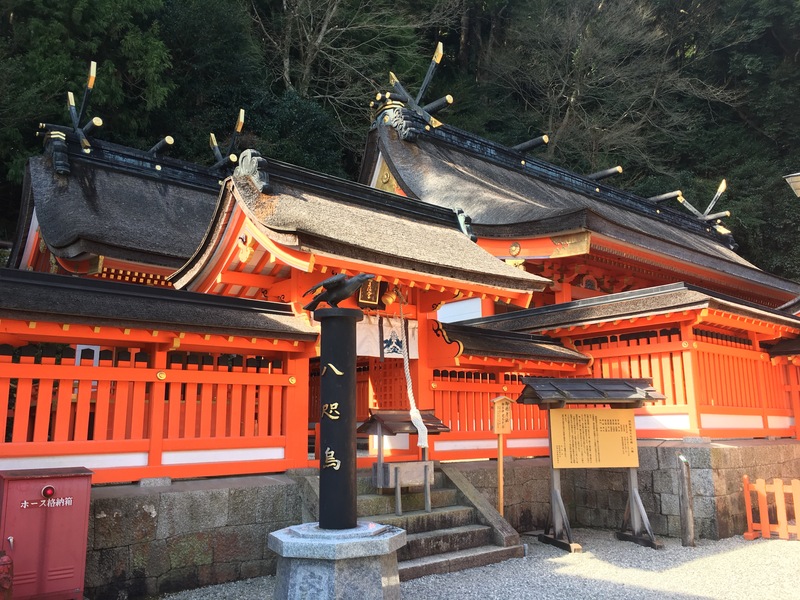 This shrine is for Yatagarasu as well. If you look carefully in a picture, you will find a crow with three legs. Yatagarasu is used in design of Japanese national football team’s uniform because it plays a role as a guidance. There is a hope that Yatagarasu would lead a Japanese national team to a victory. 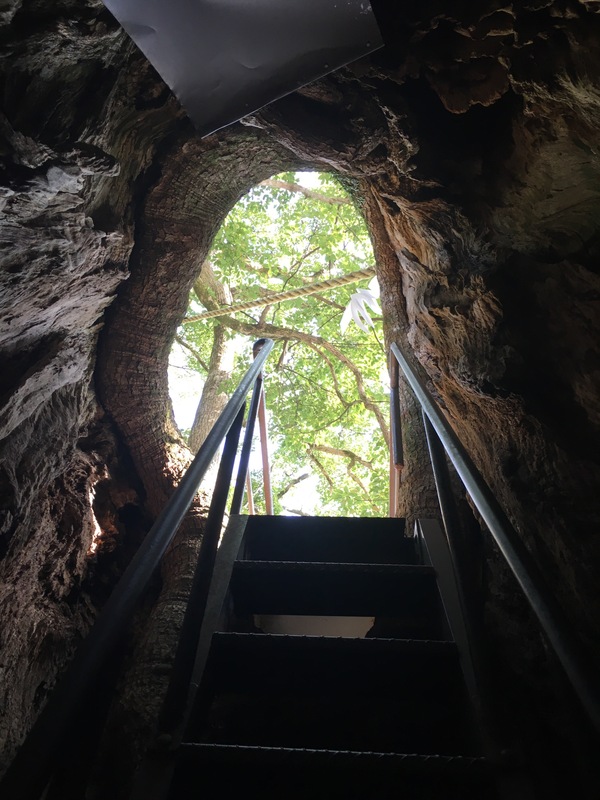 I also prayed for my good health by writing a wish board and to walk through 1,000 year old tree. I rushed back to the bus. I continued enjoying scenery from a window again. 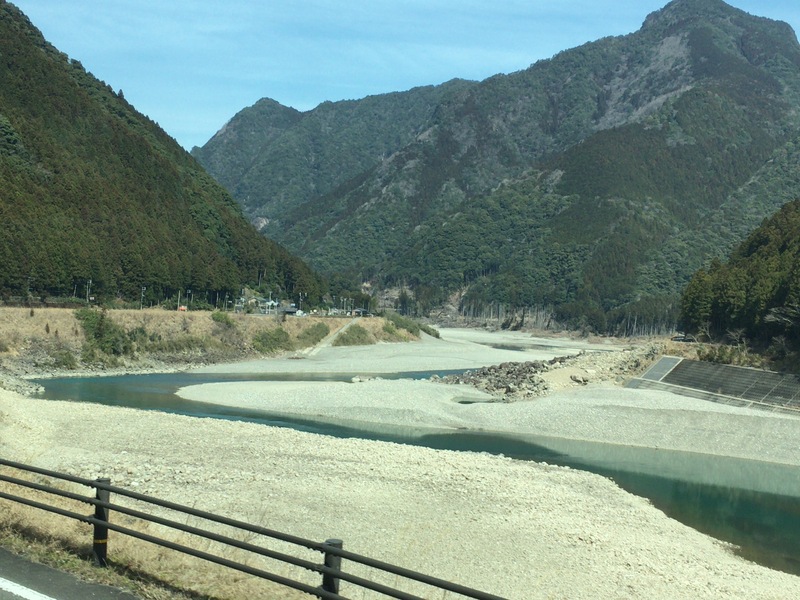 The water of Kumano River is so blue! 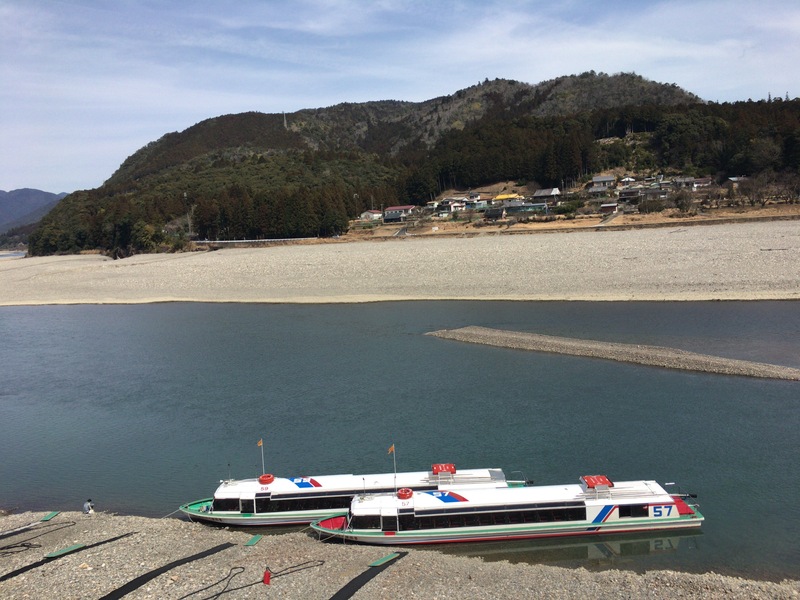 There is a boat to enjoy a river cruise, but we didn’t have time for that. 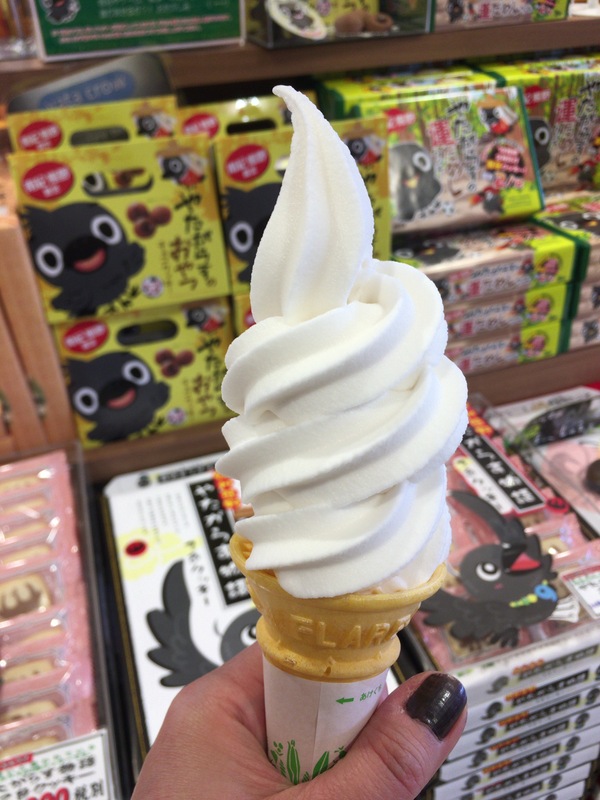 I bought my own dessert: sour plum ice cream! Next is the final destination of this trip. Last sutra recite at the temple. 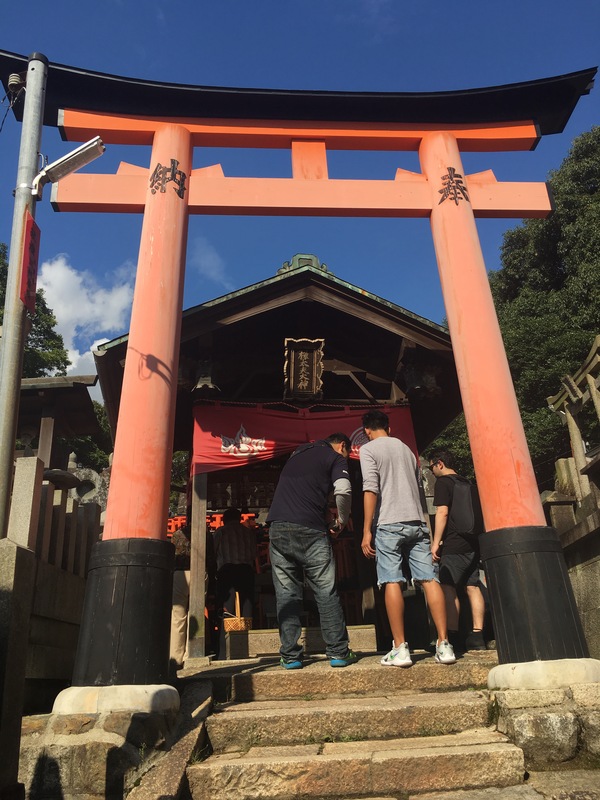 I love to visit Temples and Shrines because I can feel and touch real Japanese culture. 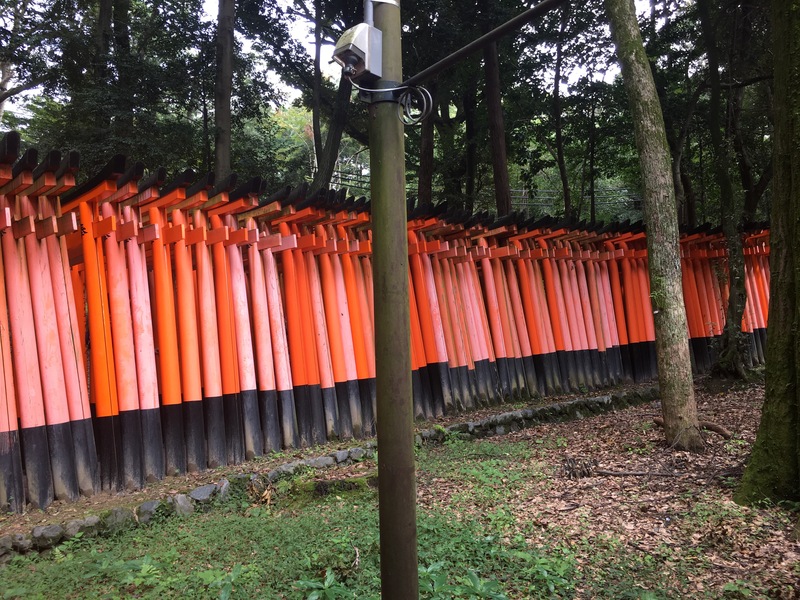 Many of them are located at peaceful places (mountain with full of trees, scenic ocean, etc). 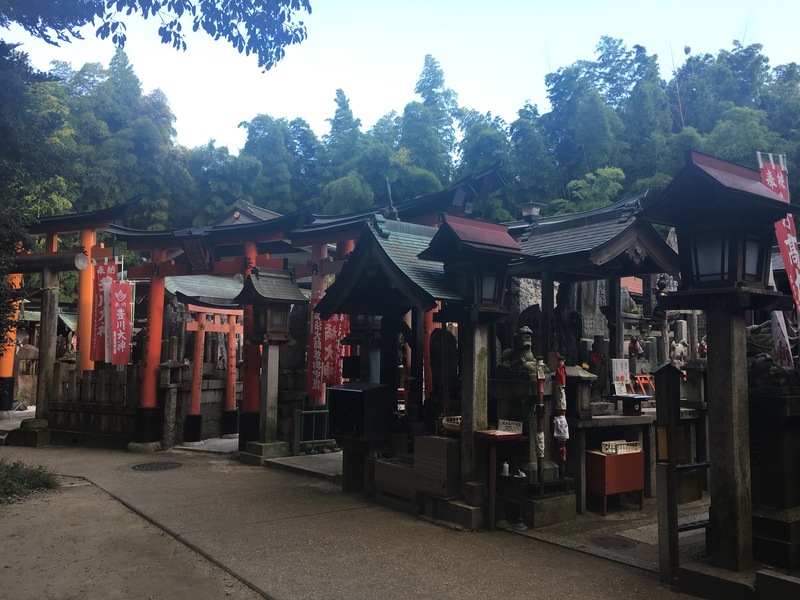 I feel refresh visiting these temples and shrines and blessed. 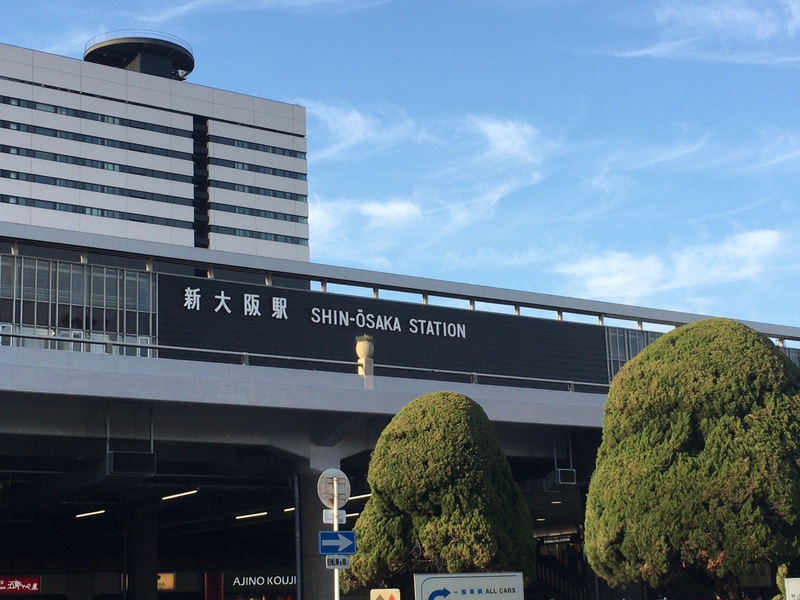 We reached Shin-Osaka Station to catch a shinkansen back home. Once I reach home, I take a shower and go to bed. 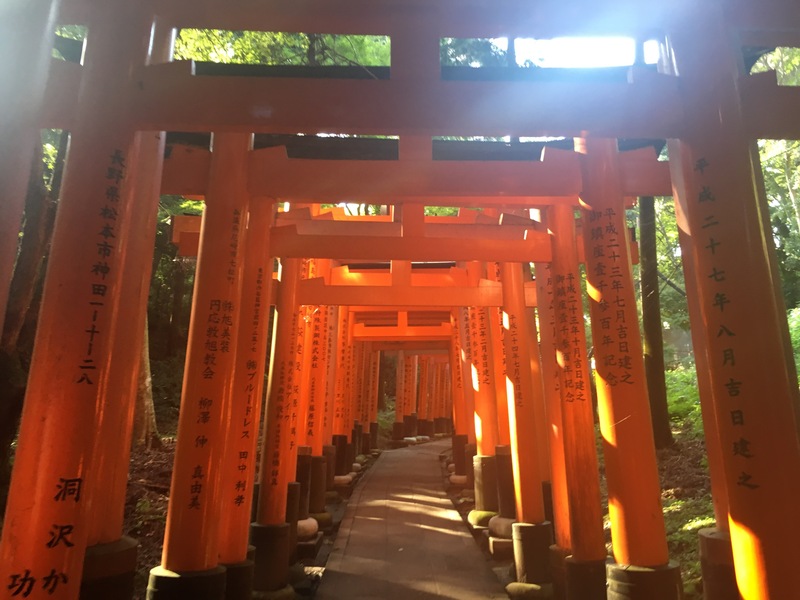 I plan to visit other 29 temples later this year.